6. Which ticket do I need for a train between Belgium and a neighbouring country? Grenstreinbus.be is a private initiative which is maintained on a voluntary basis. Its objective is to inform (potential) train and bus passengers about journeys with a cross-border train or public bus service. 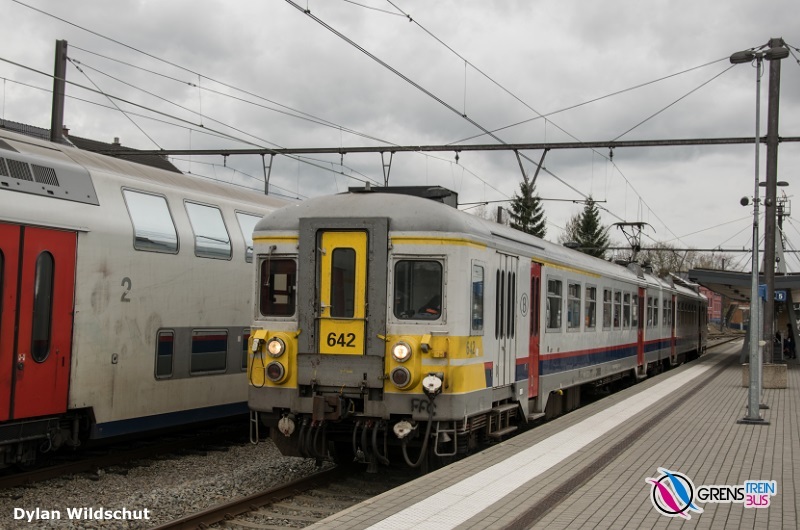 Firstly, we offer you an overview of InterCity and regional (L/RE) trains between Belgium and its neighbouring countries The Netherlands, Luxembourg, France and Germany. 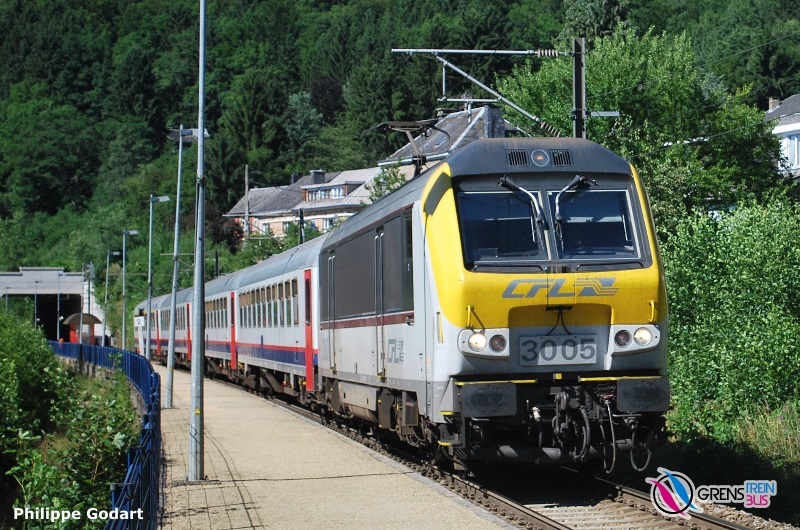 4 different train companies provide the service: NMBS/SNCB, NS, CFL and SNCF. Secondly, you can find here the most important public bus services between Belgium and its neighbouring countries. Between Belgium and The Netherlands, we have identified 25 cross-border routes operated by 5 bus companies: De Lijn, TEC, Connexxion, Hermes and Arriva. Between Belgium and France, there are 13 cross-border routes provided by 8 bus companies: De Lijn, TEC, DK&apos;BUS, Ilévia, Transvilles, SMTUS, Stibus and RDTA. We also mention a few bus services which are not strictly cross-border, but worth including because their starting point is within a few metres of the border. 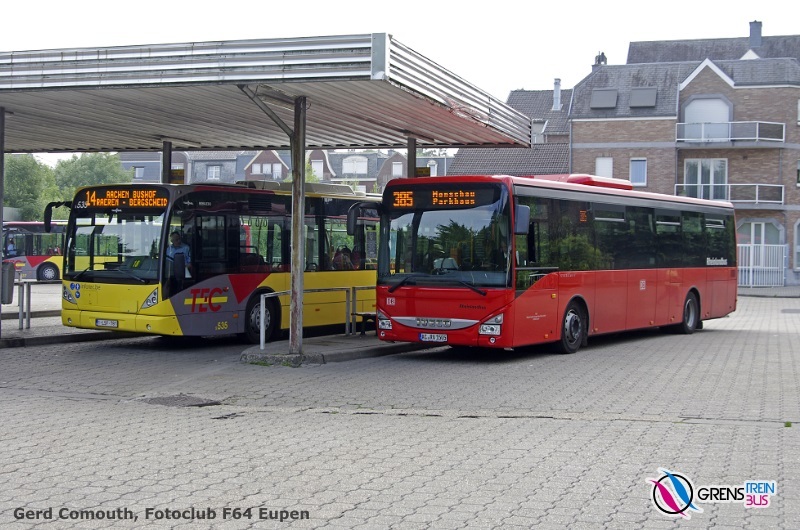 Between Belgium and Germany, there are 2 cross-border routes operated by TEC, ASEAG and DB Rheinlandbus. Between Belgium and Luxembourg, we show 3 routes operated by RGTR and 1 TEC route. All the listed trains and buses are public transport. That means you cannot reserve a seat or &apos;book&apos; a particular train or bus. With your ticket, you can take any train or bus on that particular service according to the conditions of your ticket. Our overview contains only trains which run each day at least 1x per hour in both directions (except the InterCity service Liège-Luxembourg). For buses we generally mention the most frequent services. 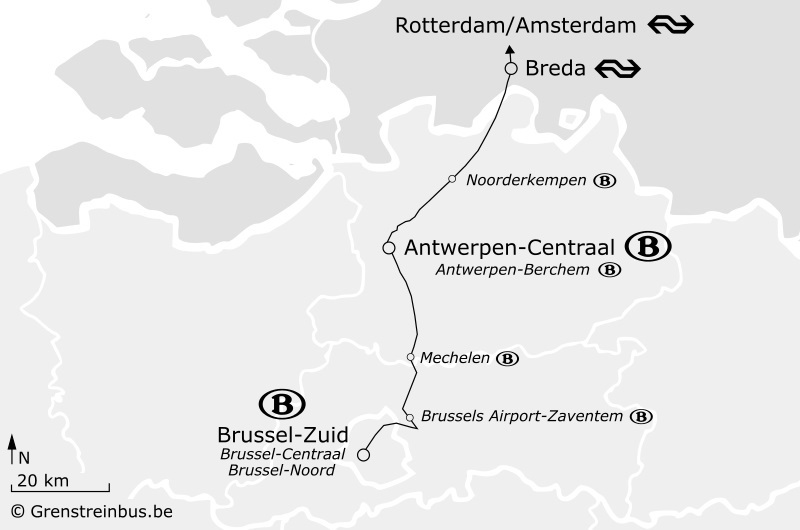 There are three active rail links between Belgium and The Netherlands used by InterCity and regional trains: Antwerp–Roosendaal (railway line 12), Antwerp–Breda (railway line 4) and Liège–Maastricht (railway line 40). Information about train tickets can be found in section 6. Watch here the journey between Antwerpen-Centraal and Roosendaal, filmed from the driver&apos;s cab. 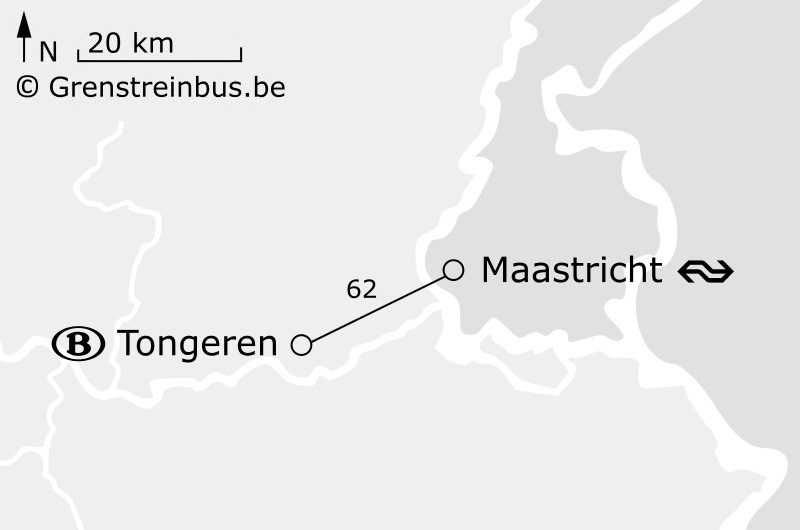 Another very useful train connection is Liège-Maastricht, which connects with Oostende–Eupen IC services. 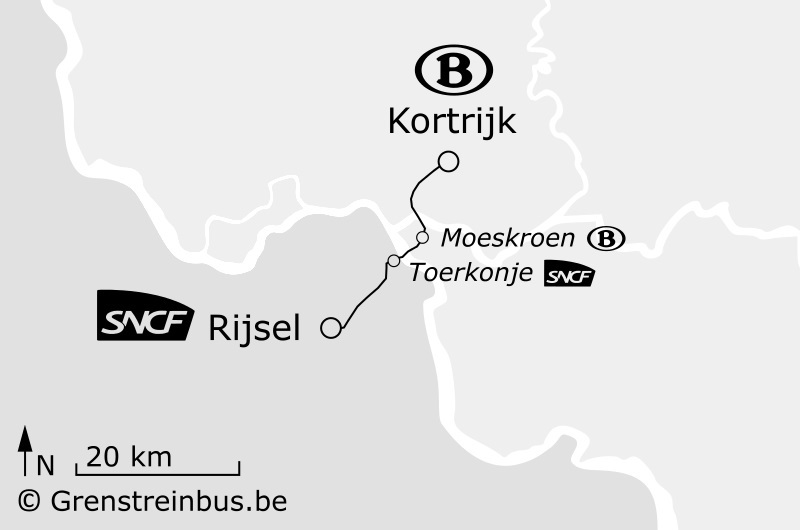 This service is operated by NMBS/SNCB and CFL. Starting in Liège, it enters Luxembourg from the north side. Brussels is connected each hour directly with the capital Luxembourg. 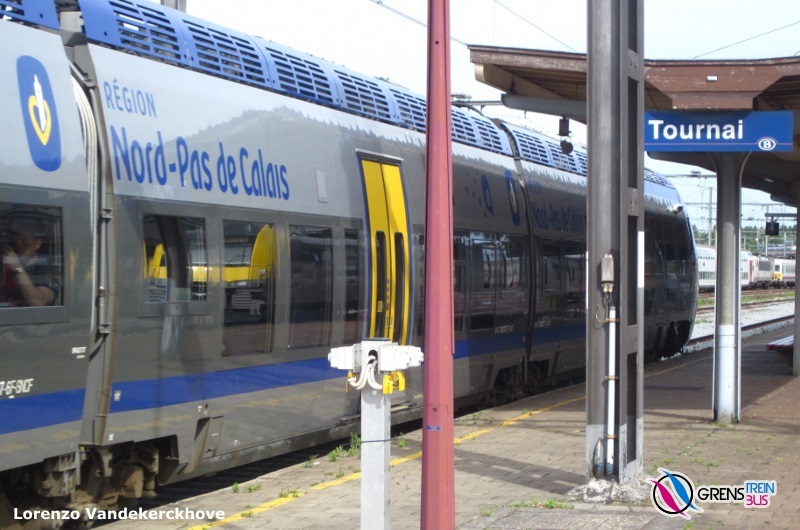 However, sometimes passengers need to change trains at Arlon. Connecting trains See above, connection IC Liège-Guillemins → Luxembourg. 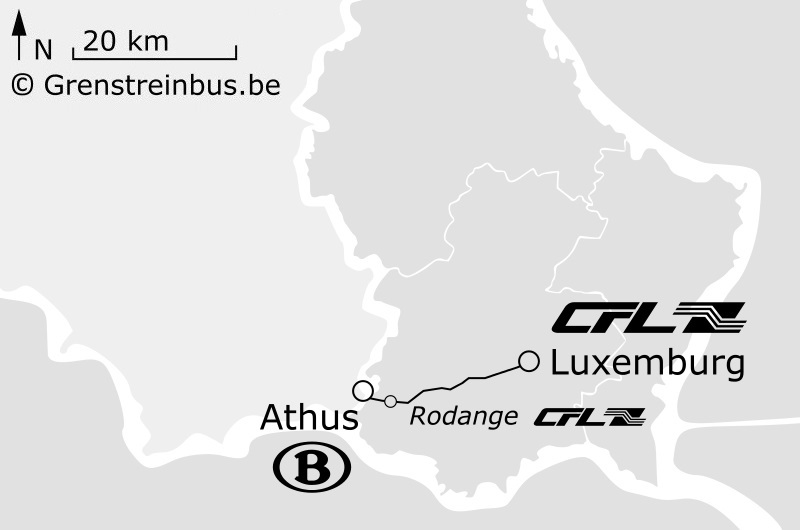 Athus, the south-easternmost NMBS/SNCB station, is the starting point of a CFL regional train which runs twice an hour to the capital Luxembourg. Although Athus is a Belgian railway station, for pricing purposes CFL counts Athus as a domestic CFL station which means you don&apos;t have to pay for an international-rate ticket. You can find further information in paragraph 6.5. Athus. 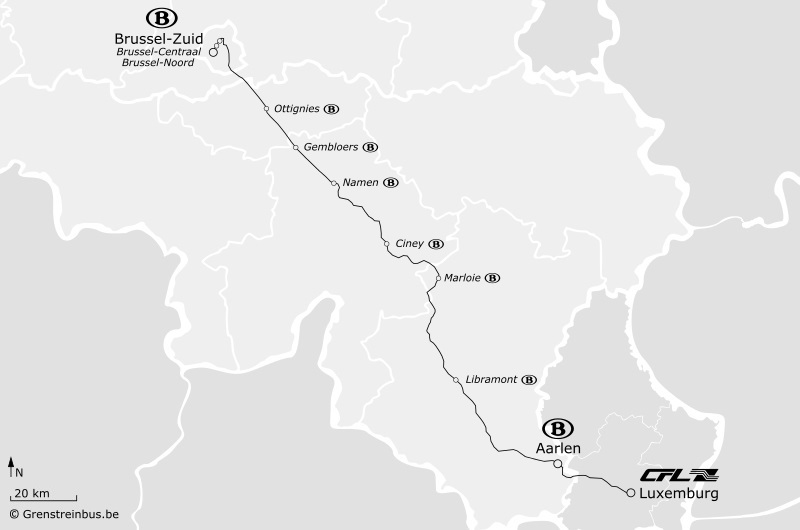 The two InterCity routes out of Belgium serve the university city of Lille. 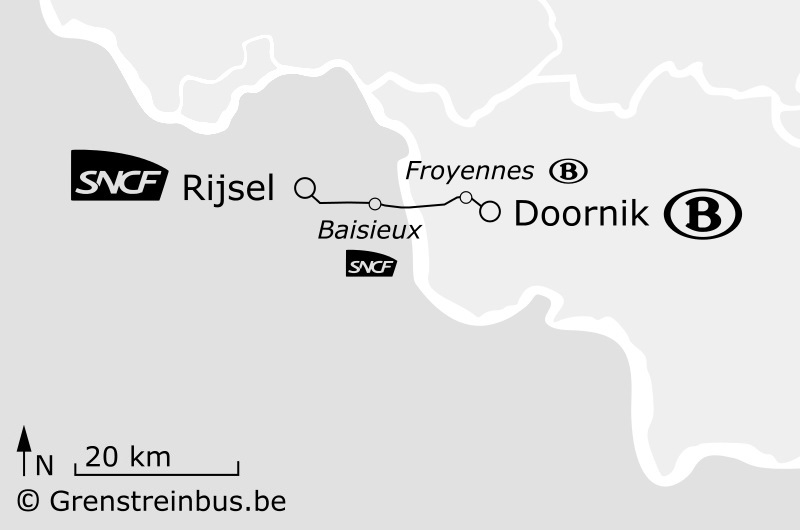 However, thanks to public transport bus services it&apos;s also possible to cross the Belgium-France border in other places such as De Panne–Dunkerque, Menen/Halluin or Komen/Comines–Armentières, Mons–Maubeuge and Dinant–Givet. *At weekends a few trains call additionally at Croix-L&apos;Allumette and Croix-Wasquehal. 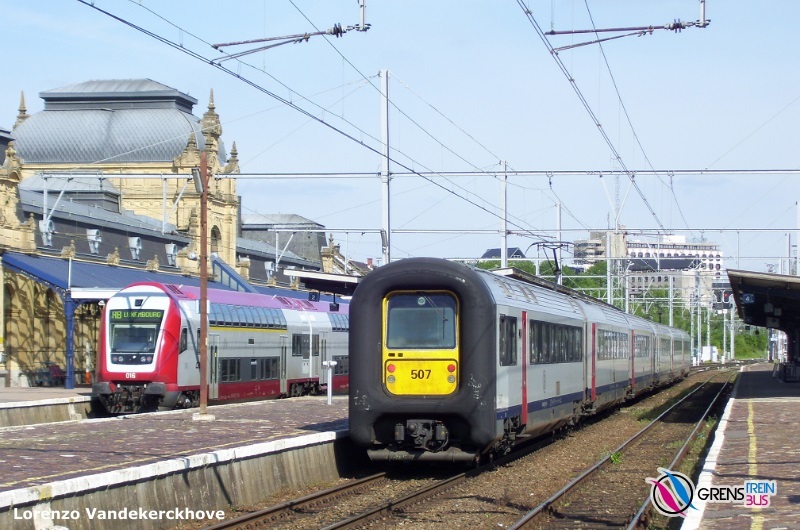 There are some through IC services from Antwerp and Ghent to Lille. These divide at Kortrijk, with one portion going forward to Poperinge, and the other to Lille. Note: some publications mention Rijsel, the Dutch name of Lille. * Not every train on this route calls at all the intermediate stations. Connecting trains See above, connection IC Kortrijk → Lille-Flandres. Note: some publications mention Doornik, the Dutch name of Tournai. Watch here the journey between Tournai and Lille-Flandres, filmed from the driver&apos;s cab. Note that although it&apos;s an electrified route, SNCF operates the service with a diesel train. For the Belgian part of the journey, you can travel with a NMBS/SNCB ticket (&apos;Go Pass 10&apos;, &apos;Rail Pass&apos;, &apos;Seniors ticket&apos;, &apos;Weekend ticket&apos;, &apos;Standard ticket&apos;, ...) between your departure station in Belgium and the last Belgian station before the border (Essen, Visé, Hergenrath, Gouvy, Arlon, Moeskroen/Mouscron or Froyennes), provided that you also have a valid international ticket between this Belgian station and your foreign destination. You can buy the international ticket from NMBS/SNCB International. The computer system of NMBS/SNCB International will ask you to select an exact time and train. That is however not binding. You can take any IC or local train you wish on the route concerned. 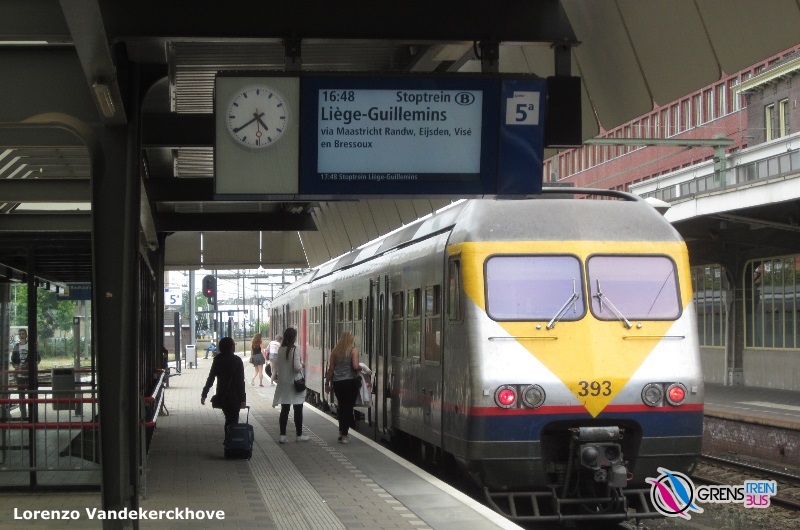 For example: if you travel with a &apos;Go Pass 10&apos; or &apos;Rail Pass&apos; and you like to travel from Brugge to Nijmegen, then you fill in Brugge–Essen on your &apos;Go Pass 10&apos; or &apos;Rail Pass&apos; and you buy an international ticket Essen–Nijmegen. Passengers from for example Gent-Sint-Pieters to Heerlen, fill in &apos;Gent–Visé&apos; and buy an international ticket Visé-Heerlen. If you go from Leuven to Aachen, fill in &apos;Leuven–Hergenrath&apos; and buy an international ticket Hergenrath–Aachen Hbf. You can buy the domestic NMBS/SNCB tickets at the NMBS/SNCB ticket machines, online via the NMBS/SNCB website, with your smartphone through the NMBS/SNCB app and at the ticket counter in many railway stations. 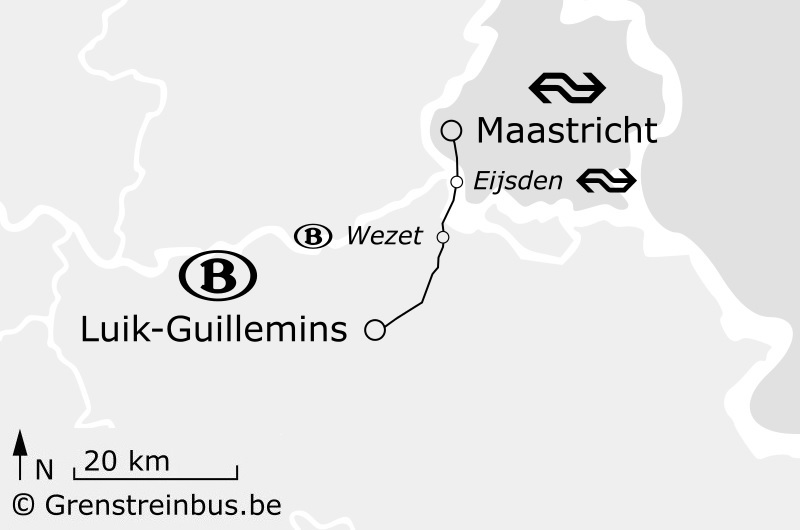 The Dutch OV-chipkaart is not valid between Brussel-Zuid/Bruxelles-Midi and Roosendaal, nor between Liège-Guillemins and Eijsden. Passengers who travel from Eijsden or Maastricht Randwyck to Maastricht can of course use the OV-chipkaart as well as passengers on the IC Brussels-Amsterdam service, between Roosendaal and Amsterdam Centraal station. Travellers must always have a valid ticket before boarding the train. However on NMBS/SNCB trains you can buy a ticket from the train manager on the condition that you inform the train manager before you board the train. Please be aware that you will pay €7.00 extra. On the IC Brussel-Amsterdam services you will get a fine of at least €50.00 for buying a ticket on the train. For travellers under 26 years old, there&apos;s a special offer. 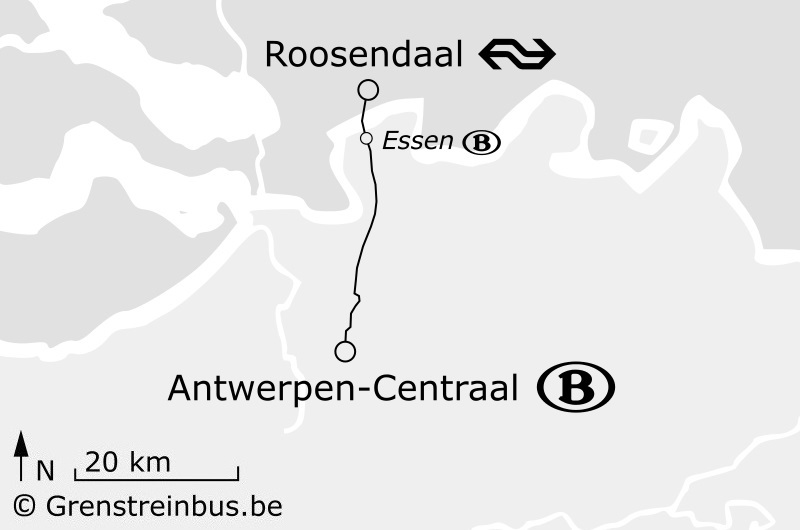 &apos;Go Pass 1 Roosendaal&apos;: a single journey between any station in Belgium to/from Roosendaal. Price: €8.20. You can also buy the &apos;Go Pass 1 Maastricht&apos; (same price) and &apos;Go Pass 1 Aachen&apos; (€8.30). You can buy these tickets by the methods mentioned above. There are also NMBS/SNCB ticket machines at Roosendaal and Maastricht stations. During the Belgian school holidays, young people under 26 years old can travel very cheaply in Belgium. The only thing you need, is a personal MOBIB card and the product &apos;Go Unlimited&apos; loaded on your MOBIB card. Youngsters who want to go to The Netherlands, can travel with the &apos;Go Unlimited&apos; to Brugge, Sint-Niklaas, Turnhout, Hasselt, Genk or Tongeren. From all of those Belgian cities there are De Lijn buses to The Netherlands. 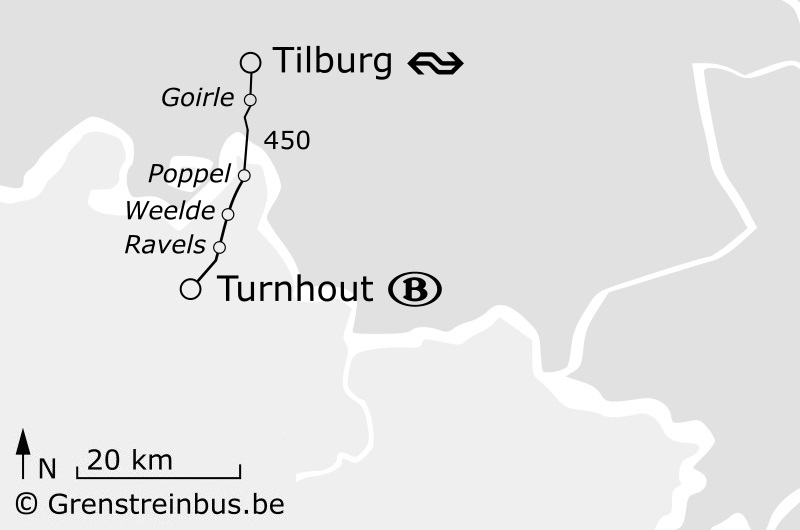 Turnhout in particular is interesting, because there you have three cross-border De Lijn bus services: 430 to Reusel bus station (with a connecting bus 319 of Bravo (Hermes) to Eindhoven station NS), 450 to Tilburg station NS (direct connection between a NMBS/SCNB station and a NS station) and 460 to Baarle-Nassau Sint Janstraat (Busstation). If you buy a &apos;Lijnkaart&apos; beforehand, you only pay €1.60 for your journey with De Lijn. This Lijnkaart is also availble in all NMBS/SNCB stations with a ticket counter. In The Netherlands you may be able to travel with an economical NS day card, available in the Dutch stores of Kruidvat, Albert Heijn, Hema or Blokker. To see the current offers, visit Treinreiziger.nl (in Dutch). 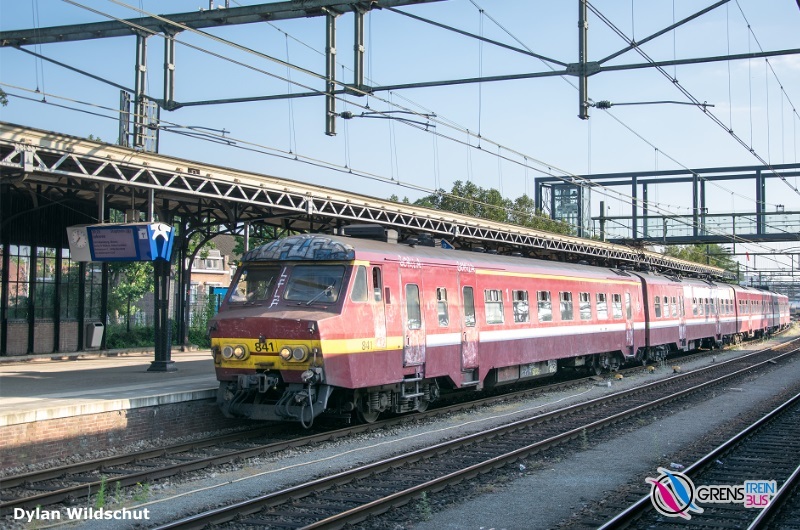 People aged 65 and older can buy the &apos;Seniors ticket Roosendaal&apos;: €10.10 for a return journey between a Belgian railway station and Roosendaal (outward and return journey on the same day). Note that from Monday to Friday these tickets are valid from 09:00, and during the Belgian summer holiday they are not valid on Saturday, Sunday and public holidays. Similar tickets: &apos;Seniors ticket Maastricht&apos; (€10.10) and &apos;Seniors ticket Aachen&apos; (€10.30). You can buy this ticket by the methods mentioned above. 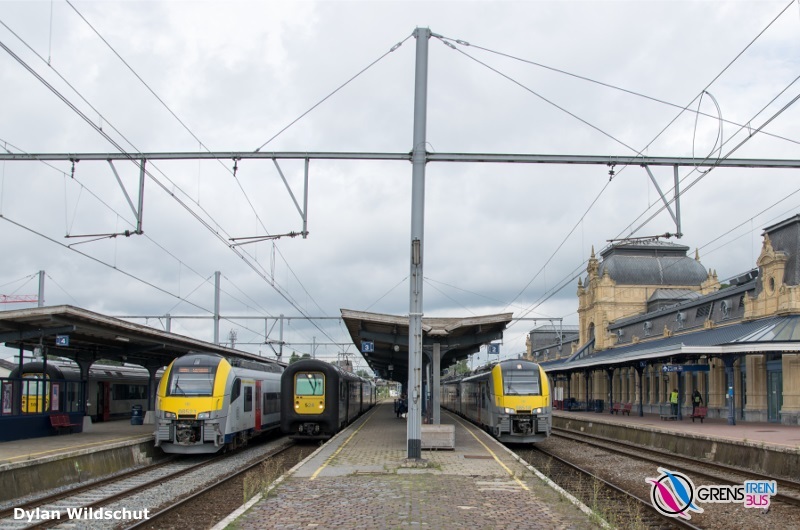 For travellers to Lille-Flandres, NMBS/SNCB and SNCF offer the useful day ticket &apos;Trampoline 1 day&apos;: €8.00 for a return trip between Kortrijk/Moeskroen and Lille-Flandres or between Tournai/Froyennes and Lille-Flandres. For children up to 11 years included, this ticket costs only €4.00. With Trampoline 1 day you can also go to French intermediate stations. Note that this ticket is only available at the following stations: Kortrijk, Moeskroen/Mouscron, Tournai and Lille-Flandres (at the ticket office and the ticket machines), also Herseaux and Froyennes (only at the ticket machine). It is not available online. You choose a ticket for either Kortrijk–Lille or Tournai–Lille. You can only make the return journey by the chosen route. For example, if you go from Tournai to Lille, you cannot go back from Lille to Kortrijk. The regional CFL train from Athus to Luxembourg is very useful for anyone wanting to travel very cheaply to Luxembourg. CFL counts Athus, the south-easternmost Belgian station, as a CFL station and doesn&apos;t charge international rates. You can buy a &apos;Dagesbilljee&apos; (&apos;Day ticket&apos; of €5.00, valid a whole day on the CFL network) or a &apos;Kuerzzäitbilljee&apos; (&apos;Short time ticket&apos; of €3.00, valid two hours on the CFL network), from the CFL train manager. It&apos;s possible to travel with your bike in the above mentioned cross-border trains as long as there is room and you have a valid ticket for your bike. Before boarding the train, you must inform the train manager that you want to travel with your bike. Depending on the train type, the train manager will open a separate compartment where you can store your bike or he/she will show where you can put the bike in the passenger accommodation. You can choose between a &apos;Bike ticket&apos; (€5.00 - a single journey for your bike between two Belgian railway stations or Roosendaal, Maastricht or Aachen) and a &apos;Bike day ticket&apos; (€8.00 - any Belgian destination including Roosendaal, Maastricht and Aachen, without timetable restrictions). Please read the information on the NMBS/SNCB website carefully. You can also find the terms and conditions for carrying your bike there. Please note that it&apos;s not possible to load or unload a bike in Brussel-Centraal/Bruxelles-Central, Brussel-Congres/Bruxelles-Congres and Brussel-Kapellekerk/Bruxelles-Chapelle. You can buy the bike tickets by the methods mentioned above. With NMBS/SNCB, children under 12 years old can travel free. For every paying passenger (aged 12 and over), 4 children under 12 can travel free of charge. There is no additional ticket needed. Your own ticket is valid for the child(ren). You must travel together with the child(ren). This regulation also applies for the L trains Antwerp–Roosendaal, Liège–Maastricht and Spa–Aachen and for the IC train Brussels/Arlon–Luxembourg. There are specific conditions for the Intercity Brussels–Amsterdam service. Children 3 years and younger travel free but will need to sit on the lap of the adult. A child from 4 years old accompanied by an adult can travel for €2.50 per one-way trip. For IC services Kortrijk–Lille and Tournai–Lille, you can buy a &apos;Trampoline 1 day ticket&apos; for children which costs €4.00. 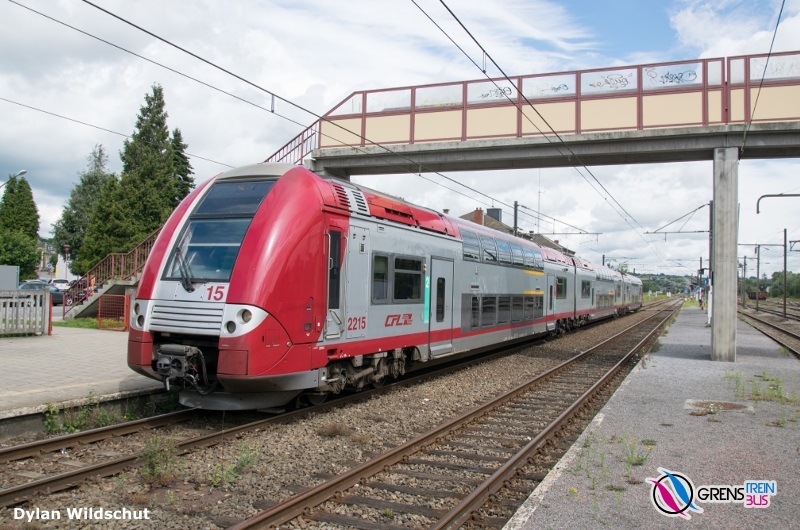 On domestic CFL trains, including trains between Athus and Luxembourg and stopping trains Arlon–Luxembourg, CFL conditions apply, so children up to 12 years can travel free. Children up to 3 years travel free on domestic SNCF services, on the lap of the paying adult. Children between 4 and 12 years can travel for a reduced price. For a request for assistance on an international journey to or from the NMBS/SNCB railway stations at Antwerpen-Centraal, Essen, Mechelen, Brussel-Zuid/Bruxelles-Midi, Brussel-Centraal/Bruxelles-Central, Brussel-Noord/Bruxelles-Nord, Brussels Airport-Zaventem, Liège-Guillemins, Spa, Welkenraedt, Ottignies, Marloie, Arlon, Kortrijk, Moeskroen/Mouscron or Tournai, please fill out the NMBS/SNCB online form &apos;Assistance request for international journey&apos; or phone the NMBS/SNCB information and assistance centre on +3225282828 (7 days a week, between 7:00 a.m. and 9:30 p.m.) at least 48 hours before you start your journey. We list below the most important bus routes from west to east. From the province of West-Vlaanderen (West Flanders), bus 42 connects the NMBS/SNCB railway station at Brugge (Bruges) with Breskens, a town in the province of Zeeland at the mouth of the Western Scheldt. There you can take the ferry going to Vlissingen station NS, where there is a train connection to Roosendaal and Amsterdam. 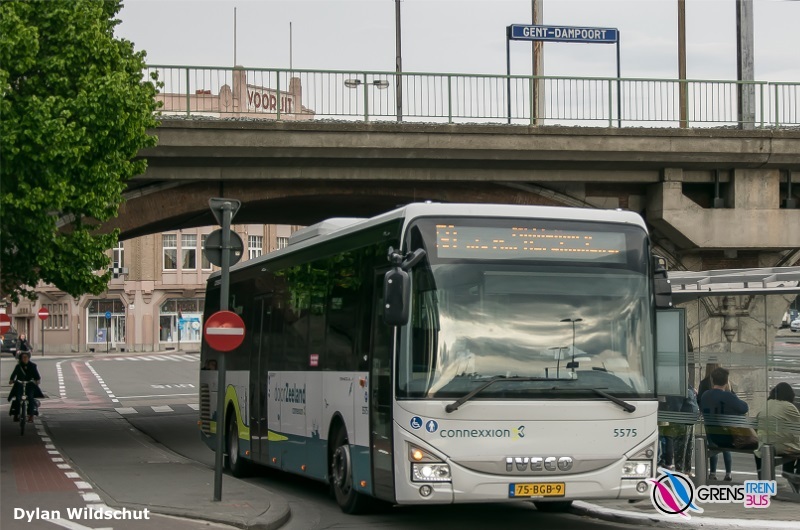 Transport companies De Lijn and Connexxion operate bus line 42 jointly, so you may see either De Lijn or Connexxion buses. You can find the timetable for line 42 on the De Lijn website. Tickets For the Brugge-Sluis section, only De Lijn tickets are valid, regardless of whether it&apos;s a De Lijn or Connexxion bus. For the Sluis-Breskens section, only Connexxion rates are valid, regardless of whether it&apos;s a De Lijn or Connexxion bus. 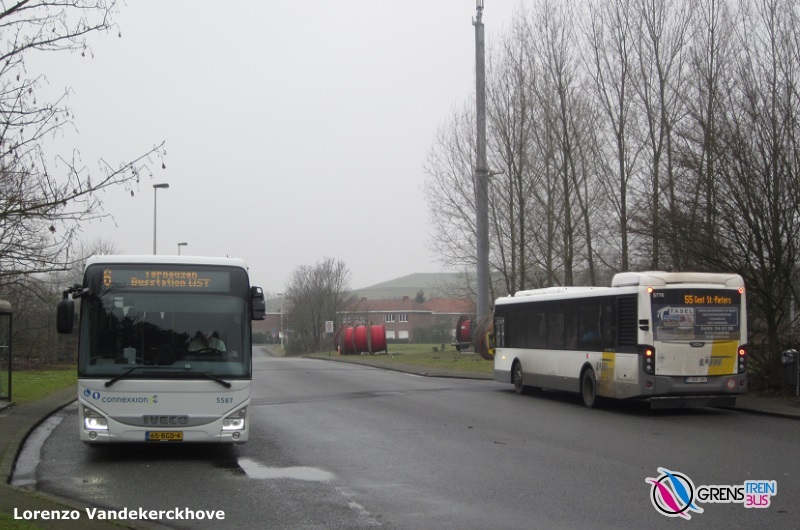 However, passengers between Brugge and Breskens can buy a single ticket from the bus driver for €6.00. For children under 12 years it costs €4.00. - &apos;Day pass&apos;: €6.00 (prepurchase) or €8,00 (from the bus driver) → paper ticket valid for travelling 1 day unlimited on the buses and trams of De Lijn. Travelling unlimited does not include the Limburg express lines. Children under 6 years can travel for free with De Lijn. For children from 6 to 11 there is a &apos;Buzzy Pazz&apos;, a pass loaded on the MOBIB card, valid for 12 months which costs €52.00. For young people 12-24 years old it costs €204.00. The Dutch OV-chipkaart is not valid for the Brugge-Sluis section. 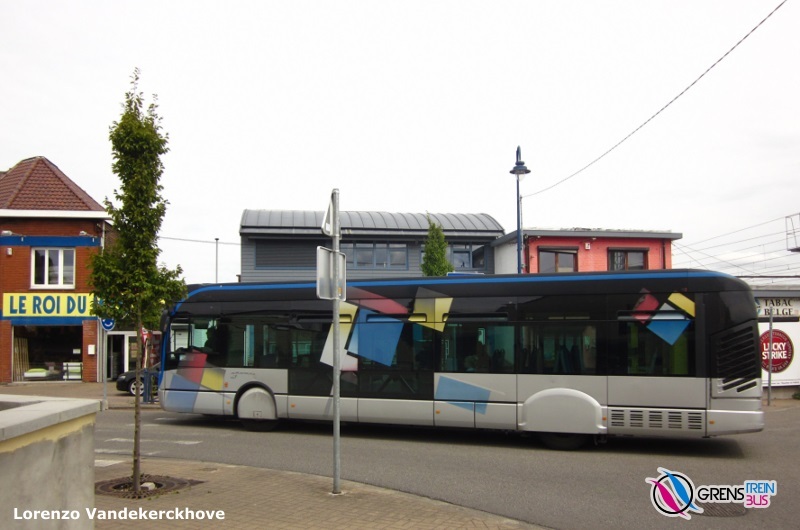 Passengers between Sluis and Breskens can use the Dutch anonymous OV-chipkaart or personal OV-chipkaart, regardless of whether it&apos;s a De Lijn or Connexxion bus. For the price of your journey, see below (9292.nl). 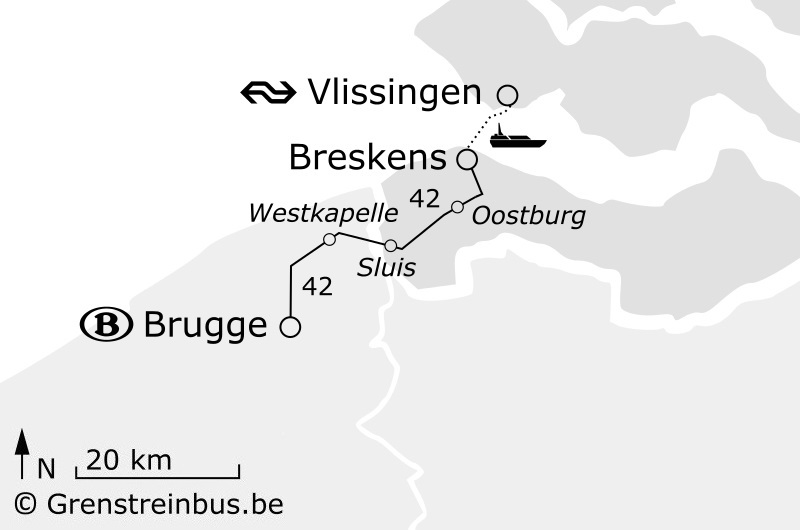 - Ferry Breskens–Vlissingen (Westerschelde Ferry), a crossing of approximately 23 minutes by a bicycle and pedestrian ferry, from Monday to Sunday, minimum 1 crossing, maximum 2 crossings per hour, at Vlissingen there is a direct NS train connection to Roosendaal and Amsterdam. 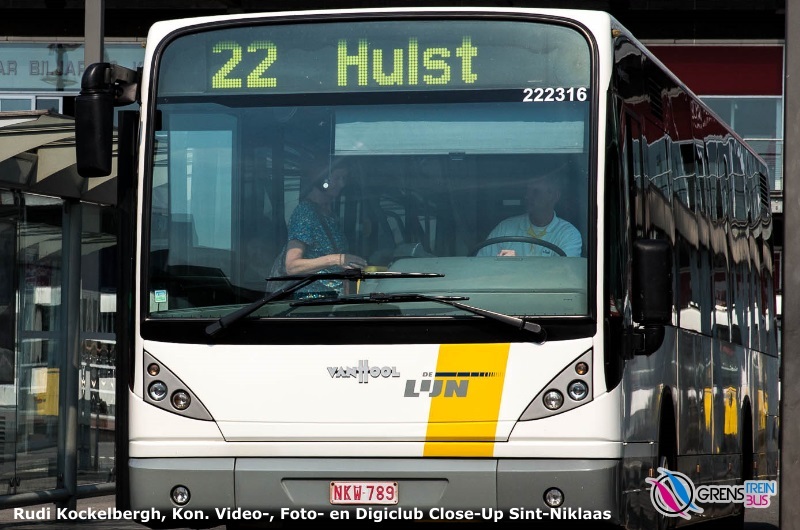 All buses on route 42 Brugge–Breskens are accessible to passengers with a wheelchair or buggy. Reservations are only required if you intend to travel on a De Lijn bus. Contact: +3259565256. Check the timetable to find out which bus is De Lijn and which is Connexxion (indicated with &apos;C&apos;). Calculate the cost of your journey between Sluis Sint Annastraat and Breskens Veerhaven with the OV-chipkaart. For the exact price, consult 9292.nl. Fill in &apos;From&apos; Sint Annastraat, Sluis and &apos;To&apos; Veerhaven, Breskens. Change the date and time if necessary and click on &apos;Plan my journey&apos;. 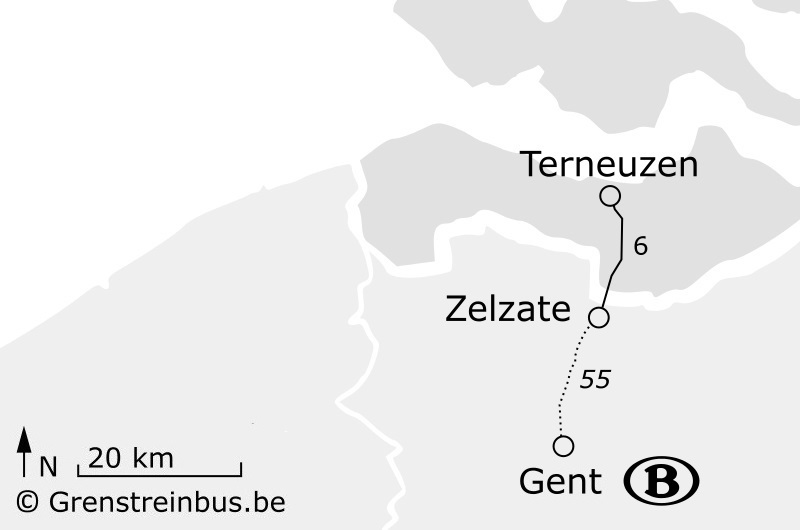 From the province of Oost-Vlaanderen (East Flanders), you can take De Lijn bus 55 from the Gent-Sint-Pieters NMBS/SNCB railway station to the Zelzate Klein Rusland bus stop. 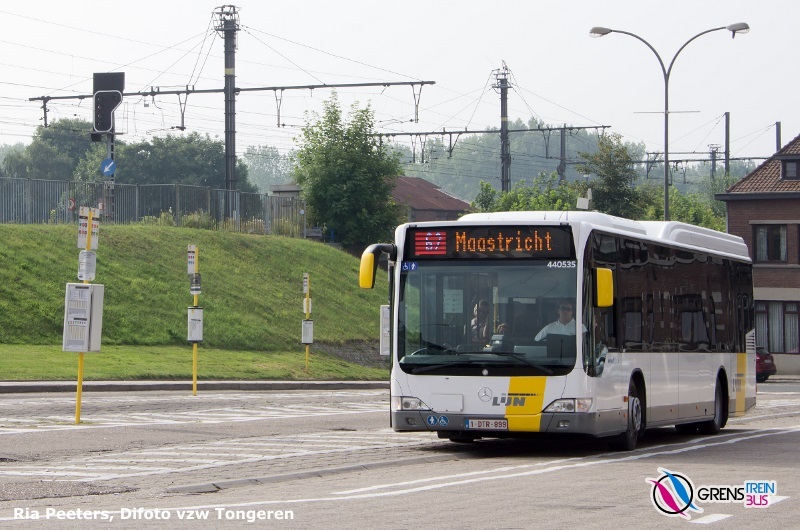 There you can change buses to Connexion bus 6 to Terneuzen bus station WST. Timetables can be found on the De Lijn website for line 55 and the Connexxion website for line 6. Tickets For bus 55, only De Lijn tickets De Lijn are valid. For bus 6, only Connexxion tickets are valid. Travelling unlimited does not include the Limburg express lines and route 42 Brugge-Breskens between Sluis and Breskens. The Dutch OV-chipkaart is not valid on this bus service. - Zelzate → Sluiskil/Terneuzen: €5.00. Note: you can only pay by debit or credit card on this bus, cash is not accepted. If you travel regularly on bus 6 to Sas van Gent, Sluiskil or Terneuzen, you can buy the Dutch anonymous OV-chipkaart or personal OV-chipkaart. For the price of your journey, see below (9292.nl). Where Daldagkaart Zeeland is not valid: On the international bus routes 42 Brugge–Breskens between Brugge and Sluis, 50 Gent–Middelburg between Gent and Terneuzen, 19 Hulst–Antwerpen–Breda between Nieuw-Namen and Antwerpen/Breda and line 395 Zierikzee–Rotterdam Zuidplein. You can buy this day card from the bus driver. Are you traveling with a child? Buy then the Connexxion &apos;Kids ticket Zeeland&apos; from the driver, which costs €1.00. Calculate the cost of your journey between Zelzate Klein Rusland and Terneuzen Busstation WST with the OV-chipkaart. For the exact price, consult 9292.nl. Fill in &apos;From&apos; Klein Rusland, Zelzate, Belgium and &apos;To&apos; Busstation Westerscheldetunnel, Terneuzen. Change the date and time if necessary and click on &apos;Plan my journey&apos;. You can find the timetable for line 50 on the Connexxion website. 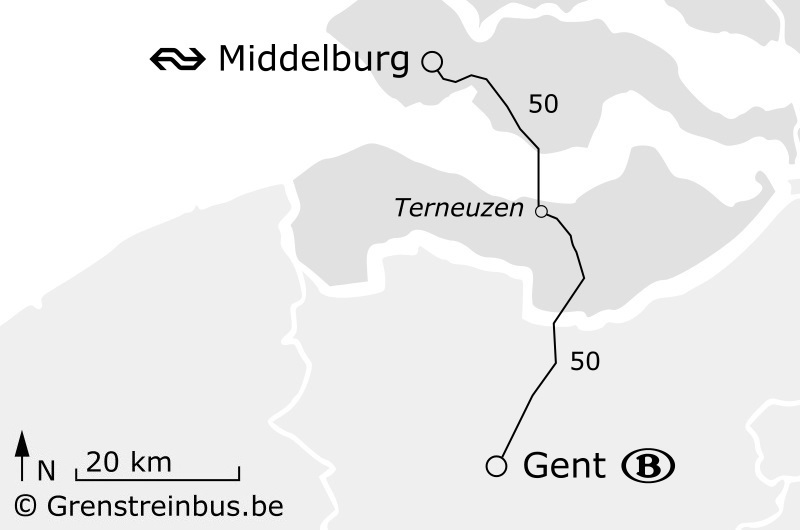 - Gent-Dampoort → Middelburg (or Goes if you change buses): €12.00. Note: you can only pay by debit or credit card on the bus, cash is not accepted. If you travel on a regular base with bus 50 to Terneuzen, you may want to use the Dutch anonymous OV-chipkaart or personal OV-chipkaart. For the price of your journey, see below (9292.nl). 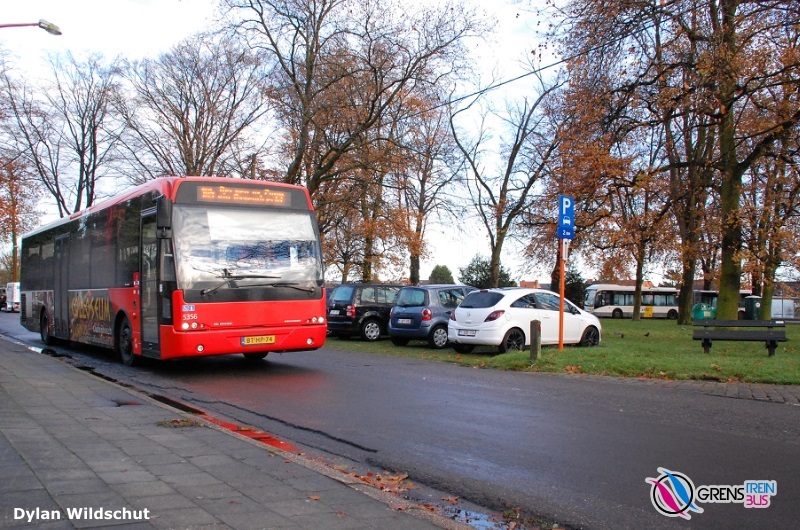 Where Dagkaart Zeeland is not valid: On the international bus route 42 Brugge–Breskens between Brugge and Sluis, 19 Hulst–Antwerpen–Breda between Nieuw-Namen and Antwerpen/Breda and 395 Zierikzee–Rotterdam Zuidplein between Bruinisse and Rotterdam. All buses on route 50 Gent–Middelburg are accessible to passengers with a wheelchair or buggy. Reservations are not required. Calculate the cost of your journey between Gent-Zuid and Middelburg Station NS with the OV-chipkaart. For the exact price, consult 9292.nl. Fill in &apos;From&apos; Zuid, Gent, Belgium and &apos;To&apos; Station Middelburg. Change the date and time if necessary and click on &apos;Plan my journey&apos;. 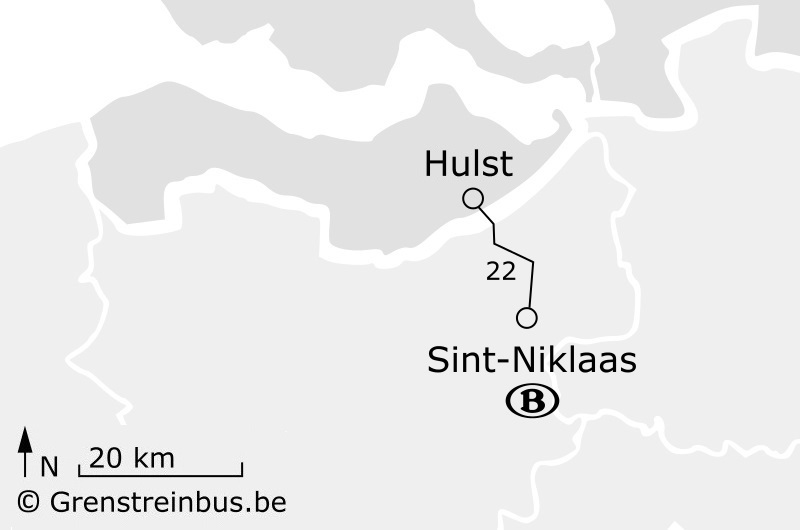 Replacing the former railway line 54, this De Lijn bus connects the NMBS/SNCB station at Sint-Niklaas with the bus station at Hulst, a city in the eastern part of Zeeuws-Vlaanderen (Zeelandic Flanders). Sporty travelers can cycle on the former railway. You can find the timetable for line 22/42/43 on the De Lijn website. At Goes station you can take a NS train in the direction of Bergen op Zoom, Roosendaal and Amsterdam. 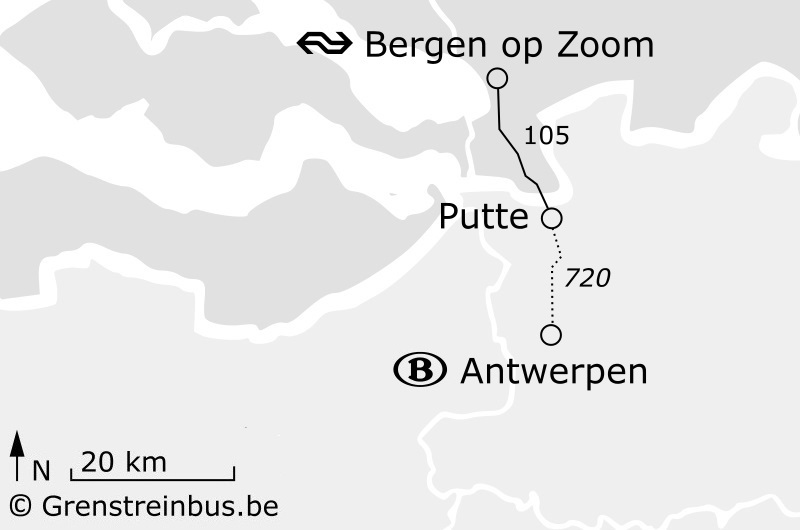 In the north west part of the province of Antwerpen (Antwerp), you can take De Lijn bus 720 to Putte Moretuslei. 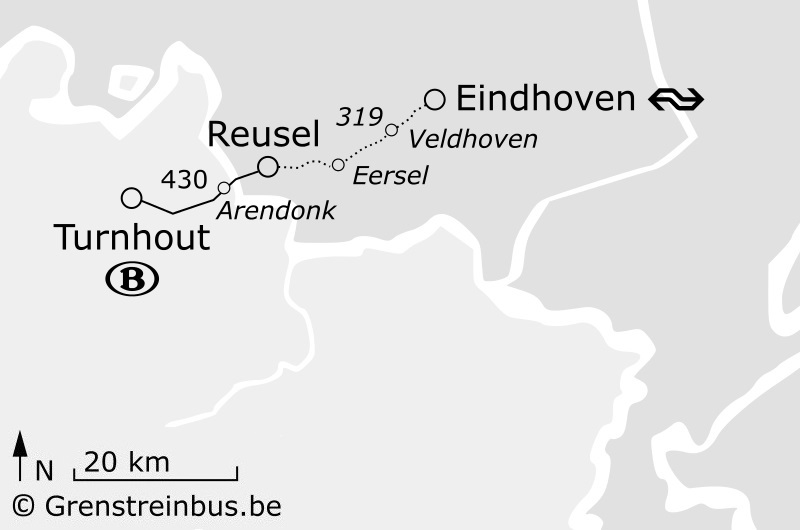 This bus starts at the Rooseveltplaats bus station, 5 minutes walking distance from Antwerpen-Centraal NMBS/SNCB station. At Putte Moretuslei you can change to bus 105 (Arriva) to Bergen op Zoom NS station. 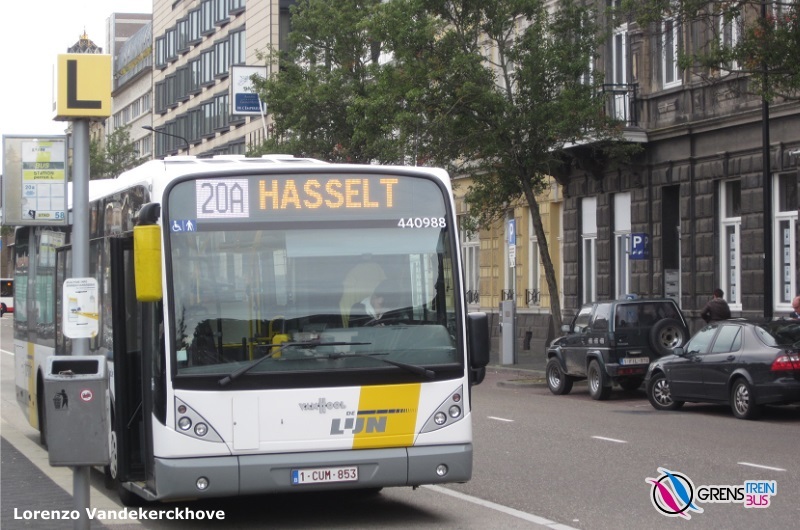 Tickets For bus 720, only De Lijn tickets De Lijn are valid. For bus 105, only Bravo (Arriva) tickets are valid. Bus 105: you can buy a single ticket &apos;Ritkaart&apos; for €3.98, valid for 1 journey, from the bus driver. 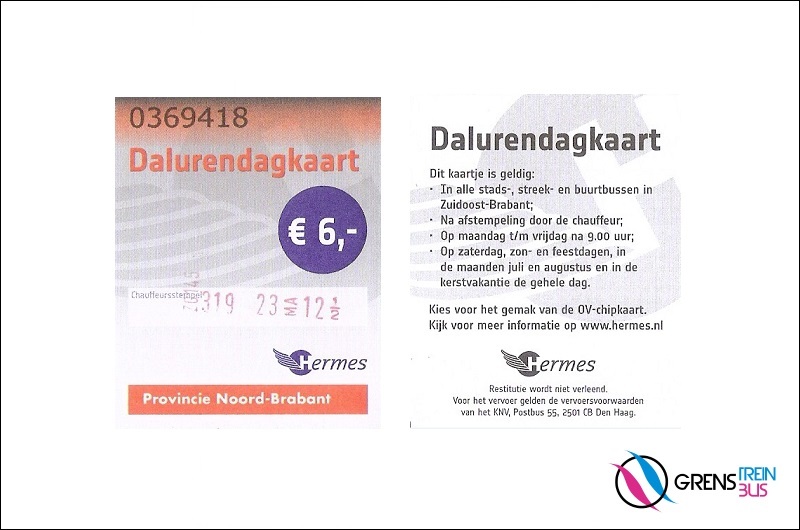 If you are making a return trip on the same day, you might prefer the day card &apos;Dalurendagkaart&apos; for €6.22. Note: you can only pay by debit or credit card on the bus, cash is not accepted. You can also travel with the Dutch OV-chipkaart, but it&apos;s more expensive than paper tickets. Children under 4 years can travel for free with Bravo (Arriva). If you travel with a &apos;Daldagurenkaart&apos; or the OV-chipkaart, a maximum of 2 children up to 11 years can travel free with a paying adult. Calculate the cost of your journey between Putte Moretuslei and Bergen op Zoom Station NS with the OV-chipkaart. For the exact price, consult 9292.nl. Fill in &apos;From&apos; Moretuslei, Putte, Belgium and &apos;To&apos; Bergen op Zoom Station. Change the date and time if necessary and click on &apos;Plan my journey&apos;. 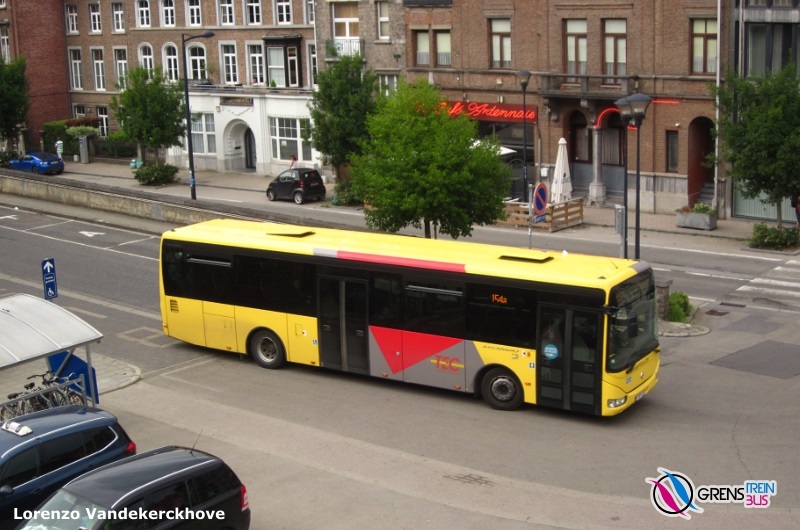 Bus route 450 in the north east part of the province of Antwerpen (Antwerp) is very useful. 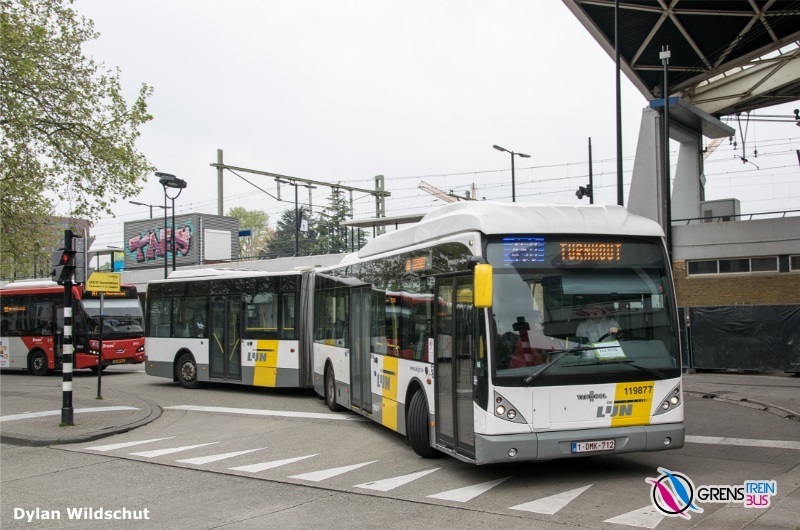 This direct bus service connects the NMBS/SNCB station at Turnhout with the NS station at Tilburg, from where you can take domestic Dutch trains to everywhere in The Netherlands. 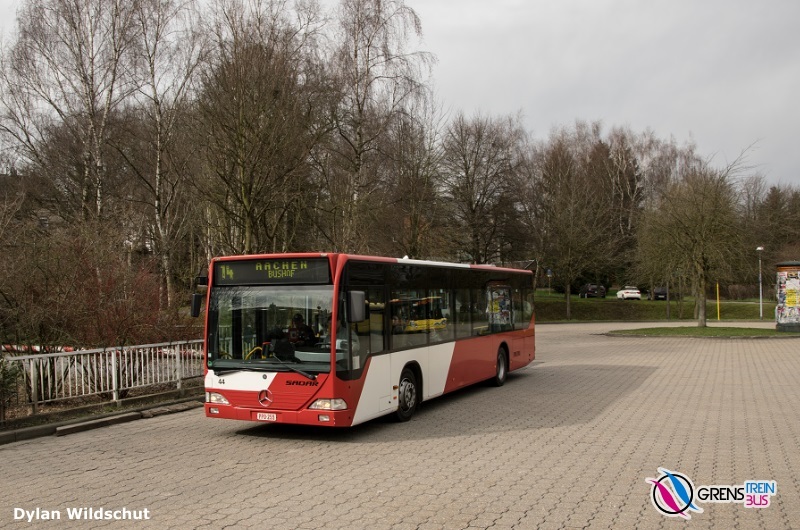 De Lijn route 450 is also a comfortable way for Belgian visitors to get to the Dutch amusement park Efteling. Eindhoven is a big university city with an airport. 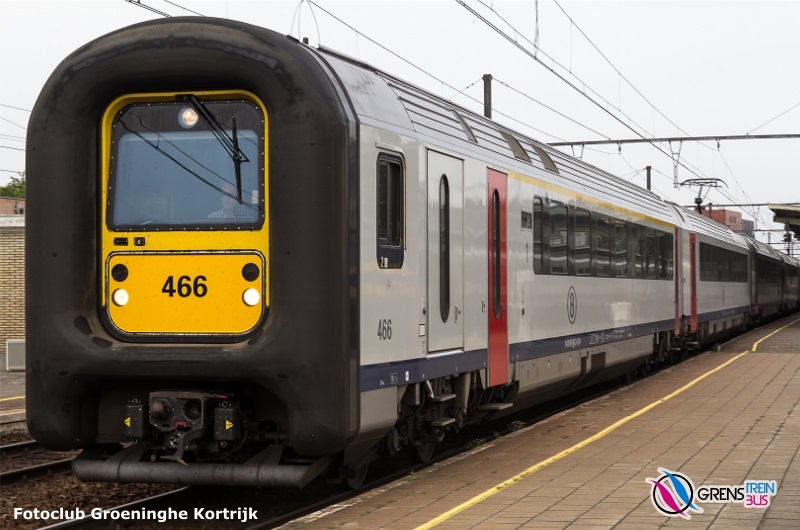 You have good train connections to &apos;s-Hertogenbosch, Utrecht Centraal and Amsterdam Centraal and also to Weert and Roermond. Therefore it&apos;s interesting to know that you can easily go by bus from Turnhout Station NMBS/SNCB to Eindhoven station NS. Please notice that you need to change buses at Reusel. Tickets For bus 430, only De Lijn tickets De Lijn are valid. For bus 319, only Bravo (Hermes) tickets are valid. 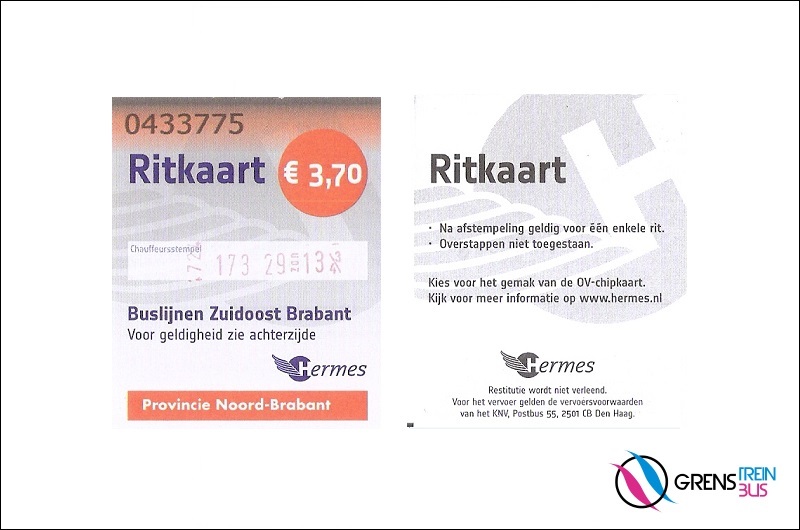 Bus 319: you can buy the paper ticket &apos;OV-ritkaart Brabant&apos;, which costs €3.98, from the Hermes bus driver. For a return trip on the same day, you can buy the &apos;Dalurendagkaartje&apos; for €6.22. Note: you can only pay by debit or credit card on the bus, cash is not accepted. You can travel with the Dutch OV-chipkaart, but it&apos;s more expensive than paper tickets. Children under 4 years can travel for free with Bravo (Hermes). If you travel with a &apos;Daldagurenkaartje&apos; or the OV-chipkaart, a maximum of 2 children up to 11 years can travel free with a paying adult. 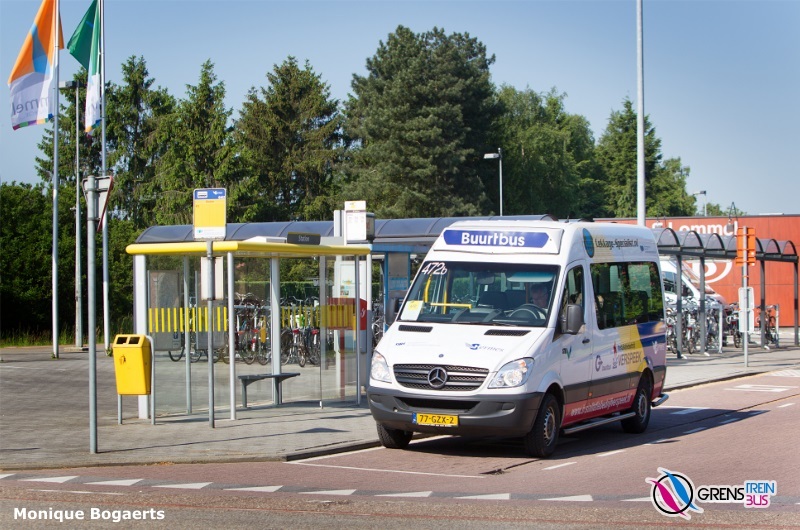 All buses on route 319 Reusel-Eindhoven are accessible to passengers with a wheelchair or buggy. Reservations are not required. Tickets If Eersel Bus station is your final destination, you can buy the paper ticket &apos;OV-ritkaart Brabant&apos;, which costs €3.98, from the Hermes bus driver. Note: you can only pay by debit or credit card on the bus, cash is not accepted. Do you travel to Eindhoven? Then choose the day card &apos;Dalurendagkaartje&apos; for €6.22. Note: you can only pay by debit or credit card on the bus, cash is not accepted. Passengers can travel with the Dutch OV-chipkaart, but it&apos;s more expensive than paper tickets. Children under 4 years can travel for free with Bravo (Hermes). If you travel with a &apos;Daldagurenkaartje&apos; or the OV-chipkaart, a maximum of 2 children up to 11 years can travel free with a paying adult. 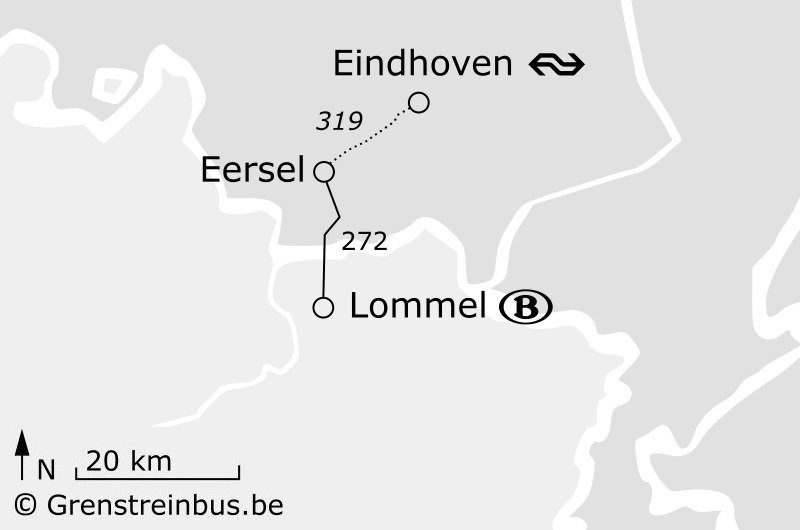 All buses on route 319 Eersel–Eindhoven are accessible to passengers with a wheelchair or buggy. Reservations are not required. 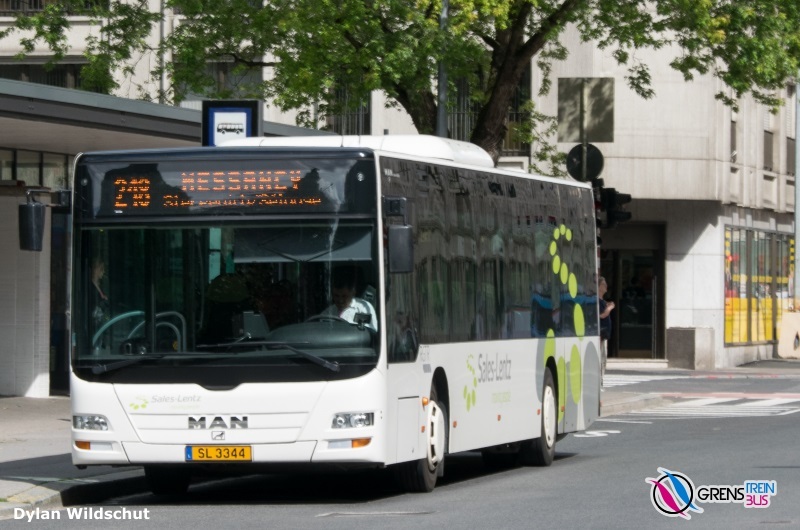 From Hasselt station NMBS/SNCB, there is bus 20a replacing the former NMBS/SNCB line 20 (Bilzen–Maastricht). It runs to the NS/Arriva station of Maastricht, which allows you to go to any destination in The Nederlands. 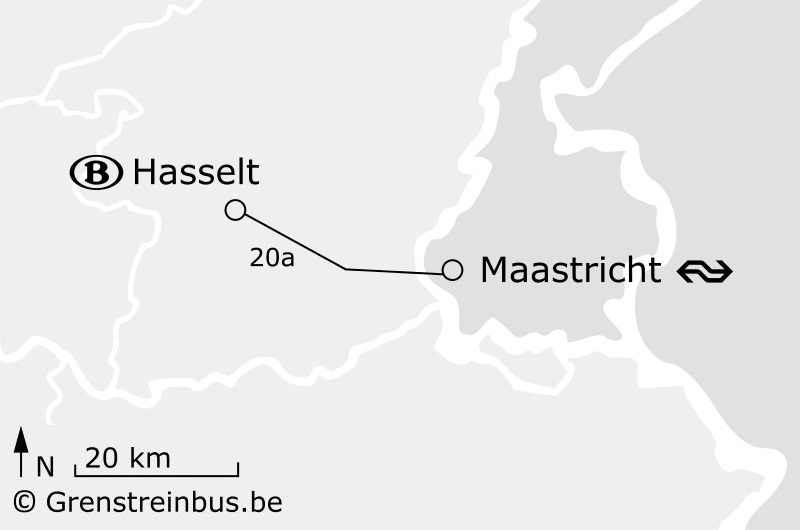 This bus is also convenient for Maastricht Aachen Airport (→ bus 30 Maastricht–Sittard). The track of line 20 is still in place, including the railway bridges crossing the Albert canal (Albertkanaal) and the Maas/Meuse. If you&apos;re travelling on a Sunday you can take the train to Genk. At the NMBS/SNCB Genk station there is bus 45 which goes to Maastricht station every 2 hours on Sunday. 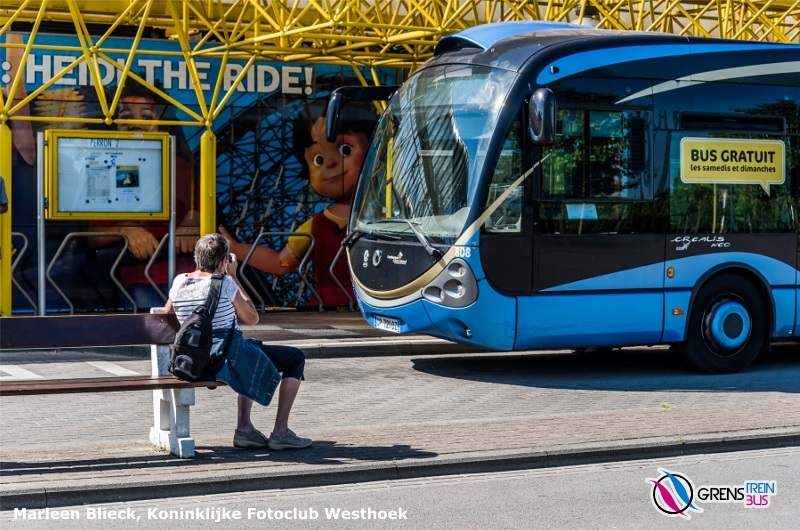 - &apos;Day pass&apos;: €6.00 (prepurchase) or €8,00 (with the driver) → paper ticket valid for travelling 1 day unlimited on the buses and trams of De Lijn. All the bus lines below are exploited by Arriva. Tickets Only TEC tickets are valid for this bus route. You can load all the TEC tickets on your personal MOBIB card, a non-transferable electronic card used as a single carrier of all your tickets. Whenever you get on the bus, you no longer need to show your ticket to the driver, but you must place your card in front of a validator. For tourists, there is the basic MOBIB card, which is transferable. You can buy a MOBIB card in an ESPACE TEC with an identity document (or an identity photo if you don&apos;t have a Belgian national register number). - &apos;Multi 6&apos; → €2.20 → multi-ride ticket valid for 6 trips which costs €13.20 → 1 trip means 1 hour unlimited travel on the entire TEC network. Travellers without MOBIB card can buy a paper ticket from the bus driver. The ticket &apos;Horizon&apos; costs €3.50 and allows you 1 hour unlimited travel on the entire TEC network. If you are making several journeys, the multi-ride ticket &apos;Multiflex&apos; of €13.20 is a good idea. Please note that you cannot buy this ticket from the bus driver, you must buy it beforehand at an ESPACE TEC. Unlimited travel does not include the TEC Express lines. Up to the age of 11 inclusive, children can travel free of charge on the entire TEC network. Note that children aged 6 to 11 travel free of charge provided they have a &apos;Horizon+ card&apos;. This pass is issued on the MOBIB card. 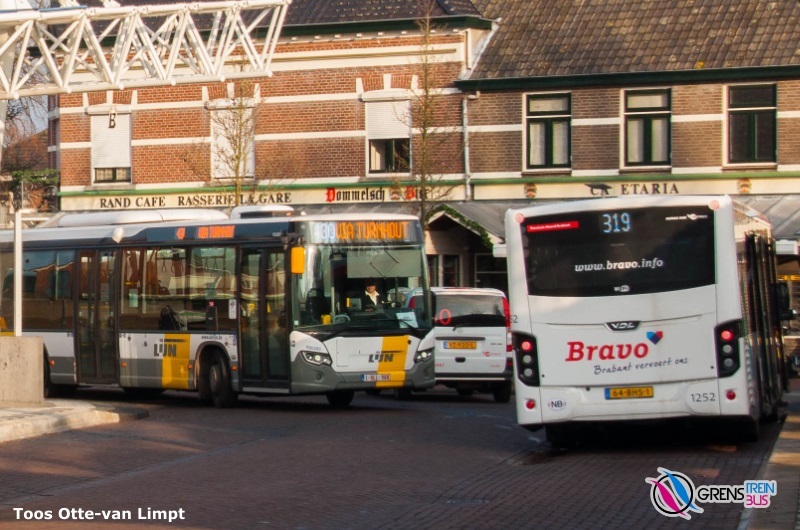 The Dutch OV-chipkaart and De Lijn tickets are not valid on this bus service. We list the most important bus lines from west to east. 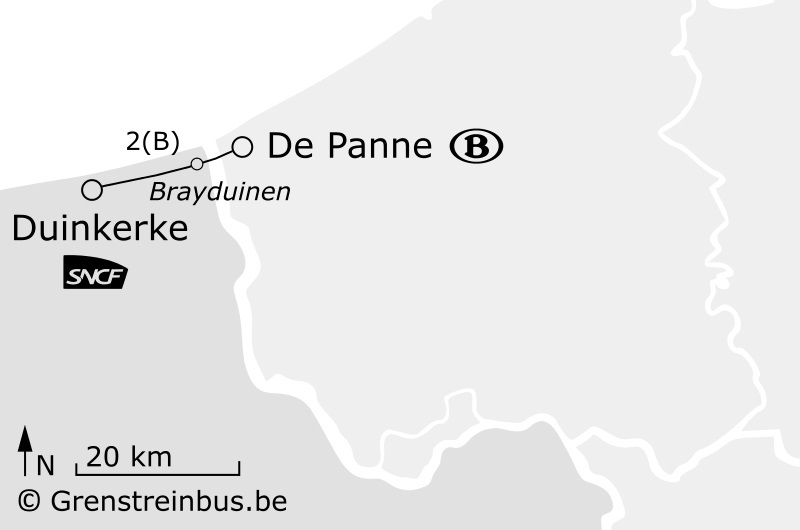 The French bus 20 connects the NMBS/SNCB station of De Panne (situated in Adinkerke) in West Flanders with the SNCF station in Dunkirk in French Flanders. 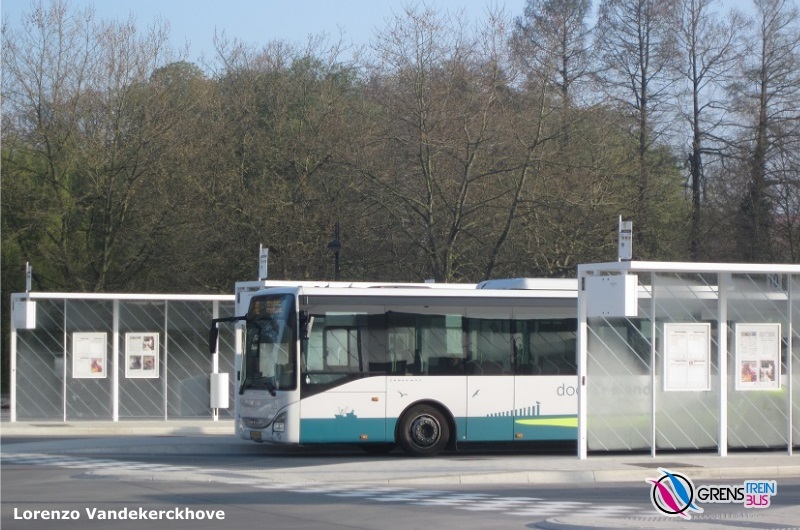 Please note that you have to change buses at Leffrinckoucke Fort des Dunes (route C1 or C2). Tickets The buses of DK&apos;BUS are free for all passengers, including the cross-border bus line 20 De Panne Station NMBS/SNCB - Leffrinckoucke Fort des Dunes. All the bus lines below are operated by Arc en Ciel. - 105 to Hazebrouck station SNCF via Bergues station SNCF. All buses on route 20/C1+C2 De Panne–Dunkerque are accessible to passengers with a wheelchair or buggy. Reservations are not required. Note: some publications mention Duinkerke, the Dutch name of Dunkerque. 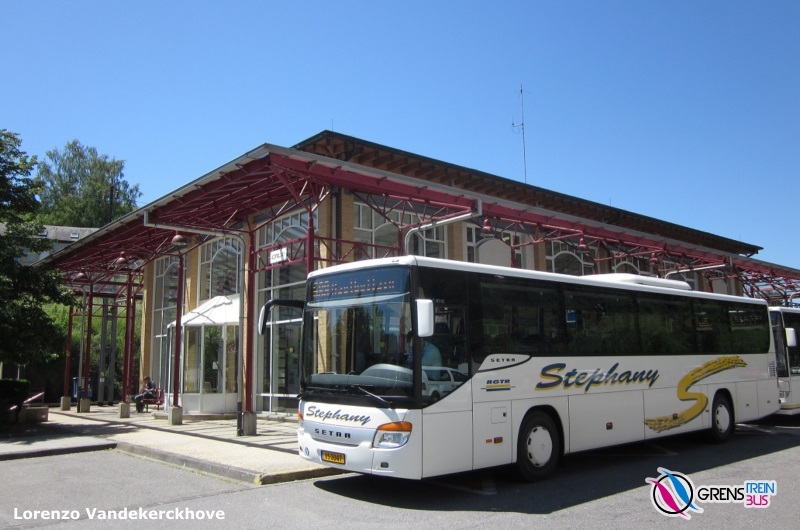 Although they are not strictly cross-border bus services, two internal French services provide a cross-border connection for those who don&apos;t mind a walk of just over a mile. 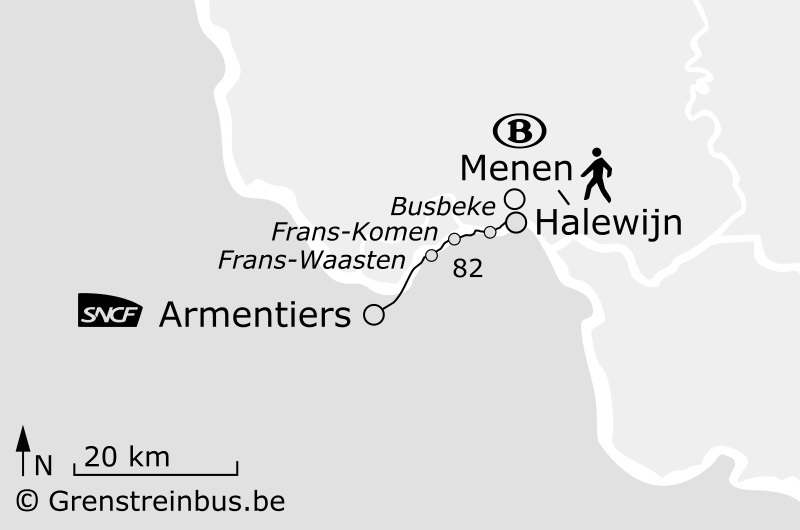 From the Delorsplein in the Belgian-French border town of Menen (B)/Halluin (F), there are French bus services 82 to Armentières Station SNCF and 91 to Lille-Flandres Station SNCF. Bus 82 is shown here. From Menen Station NMBS/SNCB, the walking distance to the Delorsplein is 2km (1.25 miles). De Lijn route 44 stops every hour at the bus stop &apos;Menen Barakken&apos;, very near to the Delorsplein. Tickets You can buy a single ticket &apos;Trajet Unitaire&apos; from the bus driver which costs €1.65. Other tickets such as &apos;Trajet Unitaire X10&apos; (prepurchase multi-ride ticket valid for 10 trips which costs €14.45) and &apos;Pass 1 Jour&apos; (day card of €4.90) are available in the 7 Ilévia shops. Kids under 4 years can travel for free with Ilévia as long as a paying adult is travelling with them. Reduced prices for youngsters and seniors are only available in electronic form on the personal Pass Pass, the French counterpart of the Belgian MOBIB card and the Dutch OV-chipkaart. 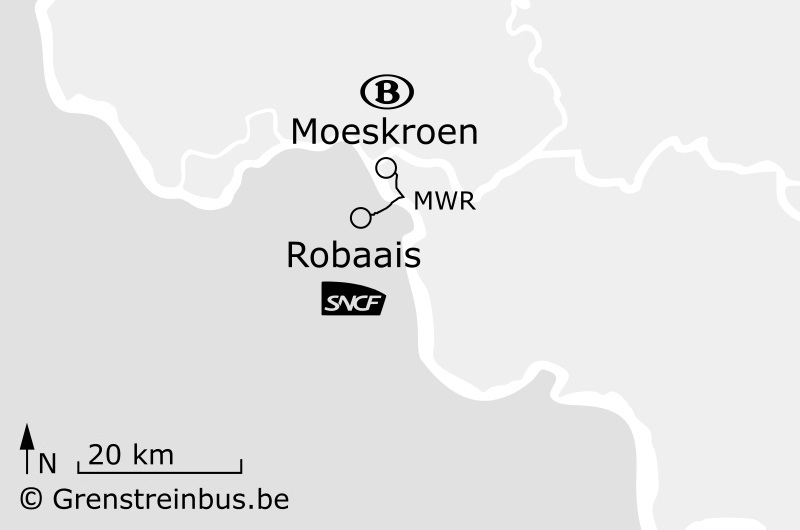 Next to the NMBS/SNCB station of Moeskroen/Mouscron (province Henegouwen/Hainaut), there is a daily MWR bus (Mouscroun - Wattrelos - Roubaix) which goes to Roubaix. Transport companies TEC and Transpole operate bus line MWR jointly, so you may see either TEC or Transpole buses. Tickets You can buy a &apos;Trajet Unitaire Transfrontalier sans correspondance&apos; from the bus driver for €2.25, valid for the whole bus route without break of journey to change buses or tram at Roubaix Eurotéléport. 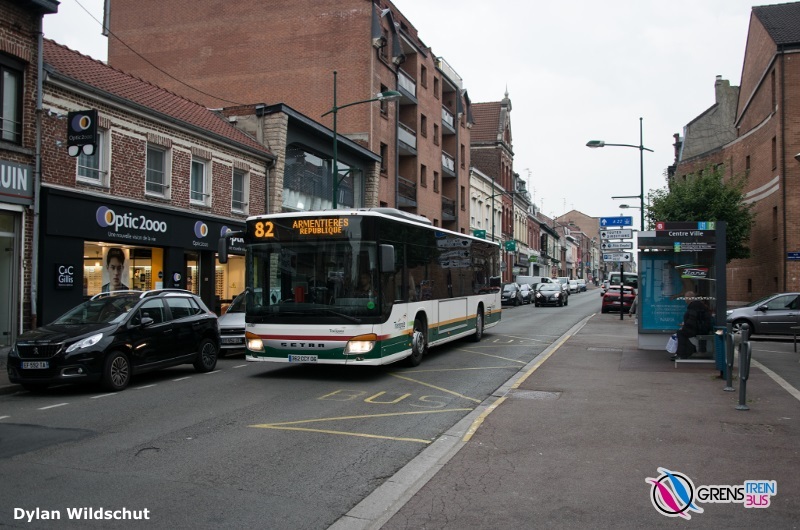 If you want to change buses or tram in Roubaix, choose the &apos;Trajet Unitaire Transfrontalier avec correspondance&apos; for €2.45. In the 7 Ilévia shops you can buy a multi-ride ticket valid for 10 trips which costs €18.20: &apos;Trajet Unitaire X10 Transfrontalier sans correspondance&apos;. If you want to change buses or tram in Roubaix, choose the &apos;Trajet Unitaire X10 Transfrontalier avec correspondance&apos; for €20.20. Kids under 6 years can travel for free with this bus as long as a paying adult is travelling with them. Reduced prices for youngsters and seniors are only available in electronic form on the personal Pass Pass, the French counterpart of the Belgian MOBIB card and the Dutch OV-chipkaart. The walking distance from the bus/tram station Roubaix Eurotéléport to the SNCF station of Roubaix is 1.4 km, 20 minutes walking. The easiest route is via Grand-Place and Av. Jean Lebas. It&apos;s also possible to take the metro with a &apos;Trajet Zap&apos;. Note: some publications mention Robaais, the Dutch name of Roubaix. 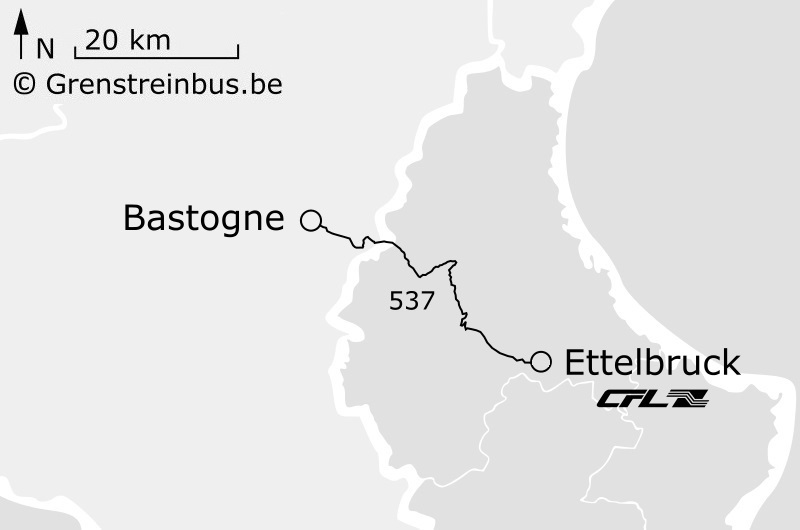 Every hour a NMBS/SNCB train connects Charleroi-Sud with Erquelinnes, a railway station situated 300 metres before the Belgian-French border. 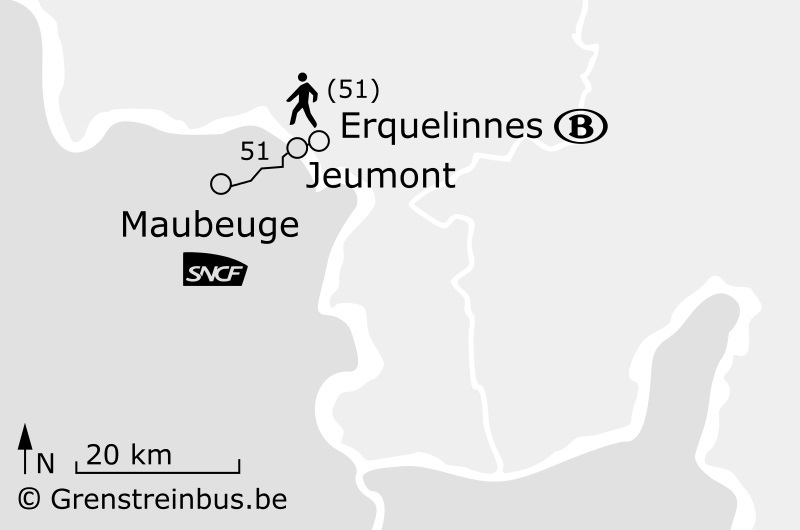 You walk over the border and at the bus stop &apos;Jeumont Douane&apos; you can take 2x/hour bus A to Jeumont Station SNCF and Maubeuge Station SNCF, from Monday to Saturday. However, from Monday to Friday 8 buses (generally 1 bus every 2 hours) start at Erquelinnes Station NMBS/SNCB. Tickets You can buy the single ticket &apos;Ticket unitaire&apos; from the driver for €1.30, valid for the whole bus route with, if necessary, 1 change within 1 hour. There is also a prepurchase multi-ride ticket &apos;Carnet de tickets libre parcours&apos; valid for 10 trips which costs €10.10, only available in the Stibus shop in front of the SNCF station at Maubeuge. 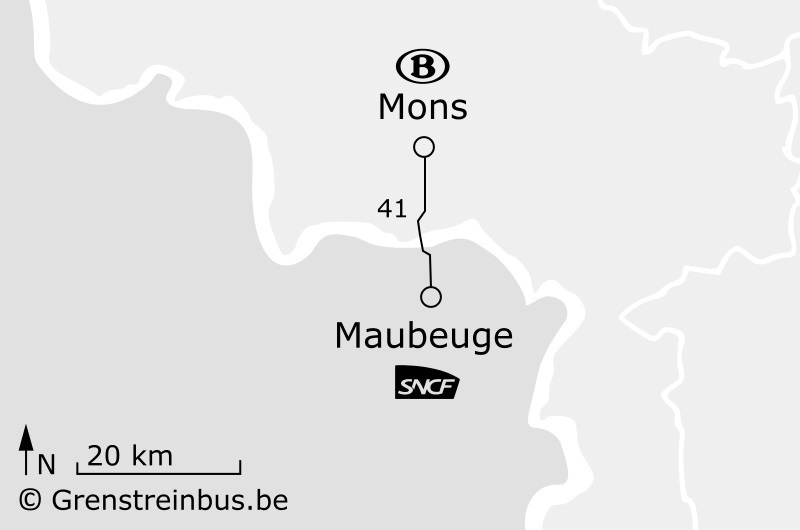 This is a useful service because from Maubeuge Station SNCF you can take a direct intercity train to Paris. 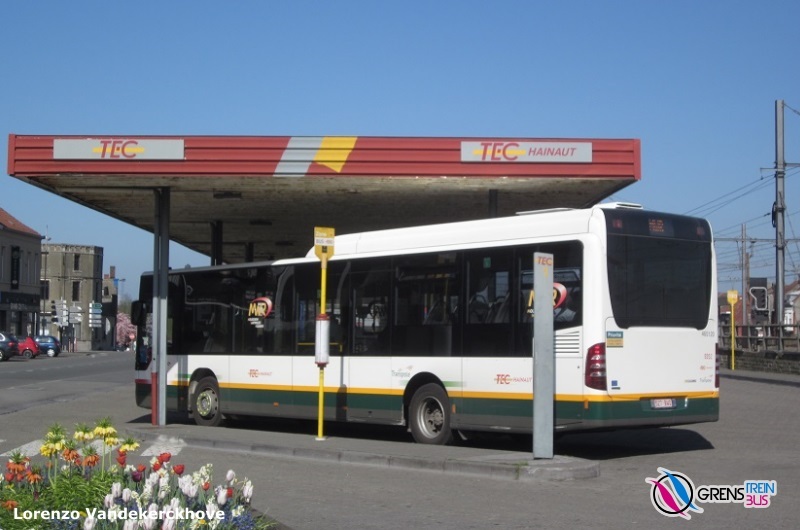 Transport companies TEC and SMTUS operate bus line 41 Mons-Maubeuge jointly, so you may see either TEC or SMTUS buses. You can find the timetable for line 41 on the TEC website. Tickets Only TEC tickets are valid for this international bus route. You can load all the TEC tickets on your personal MOBIB card, a non-transferable electronic card used as a single carrier of all your tickets. Whenever you get on the bus, you no longer need to show your ticket to the driver, but you must place your card in front of a validator. For tourists, there is the basic MOBIB card, which is transferable. You can buy a MOBIB card in an ESPACE TEC with an identity document (or an identity photo if you don&apos;t have a Belgian national register number). Note: for internal journeys in France on bus 41 (between two French bus stops), only SMTUS tickets are valid. You can purchase a ticket &apos;Le ticket à l&apos;unité&apos; for €1.30, which is valid for the French part of this route, from the driver. 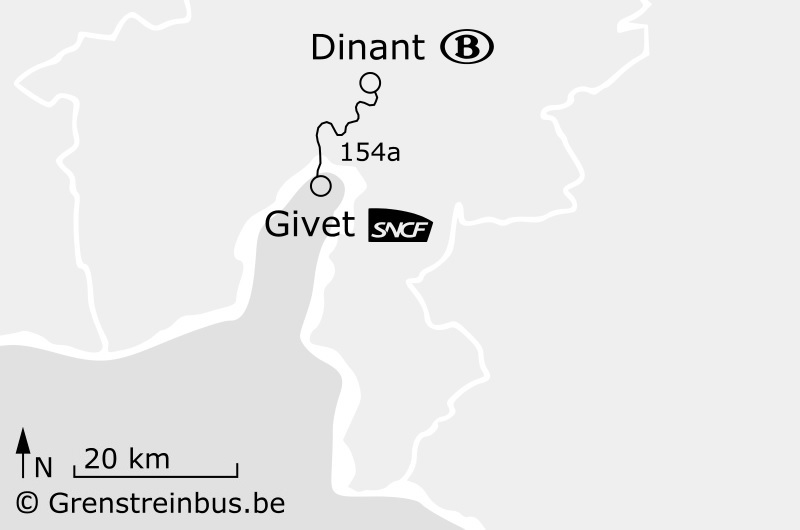 Replacing the former railway line 154 (track is still in place), this TEC bus connects the NMBS/SNCB station at Dinant with the SNCF station at Givet. 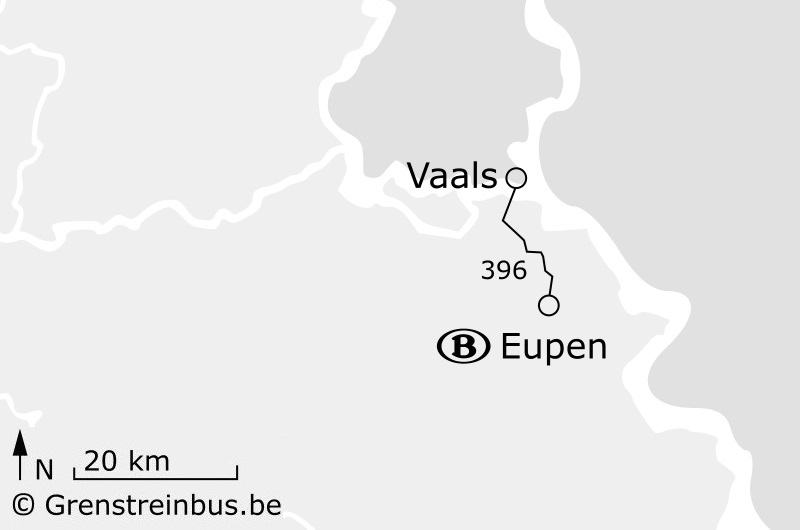 The bus follows the Maas/Meuse river and the railway line. Sunday service on Belgian holidays. Travellers without MOBIB card can buy a paper ticket from the bus driver. The ticket &apos;Horizon&apos; costs €3.50 and allows you 1 hour unlimited travel on the entire TEC network. If you are making several journeys, the multi-ride ticket &apos;Multiflex&apos; of €13.20 is a good idea. Please note that you can not buy this ticket from the bus driver, you must buy it beforehand at an ESPACE TEC. From Charleville-Mézières there are TER trains to Reims, Longwy, Metz and Lille-Flandres. The city of Eupen, in the German speaking region of Belgium, is well connected with the city of Aachen in Germany. 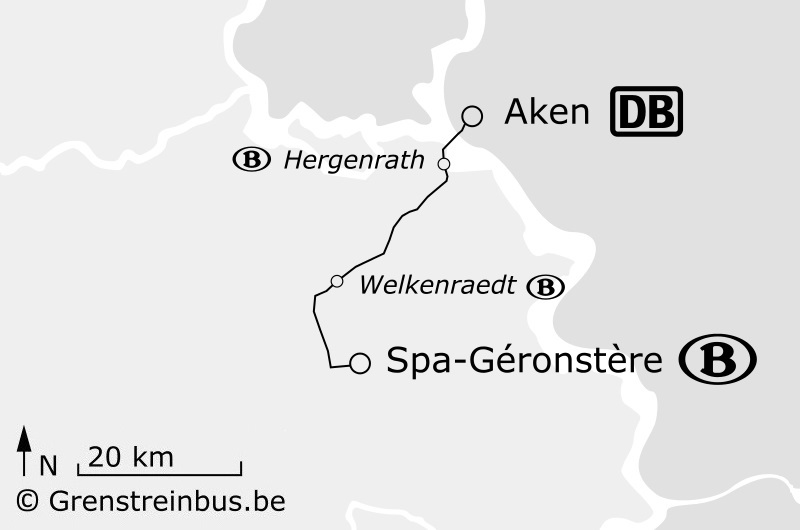 There is a railway between Welkenraedt and Aachen, but passengers can also take bus 14, operated jointly by the Belgian TEC and the German ASEAG. Tickets Between Eupen and Köpfchen Altes Zollamt, TEC tickets are valid. Between Köpfchen and Aachen, ASEAG tickets are valid. 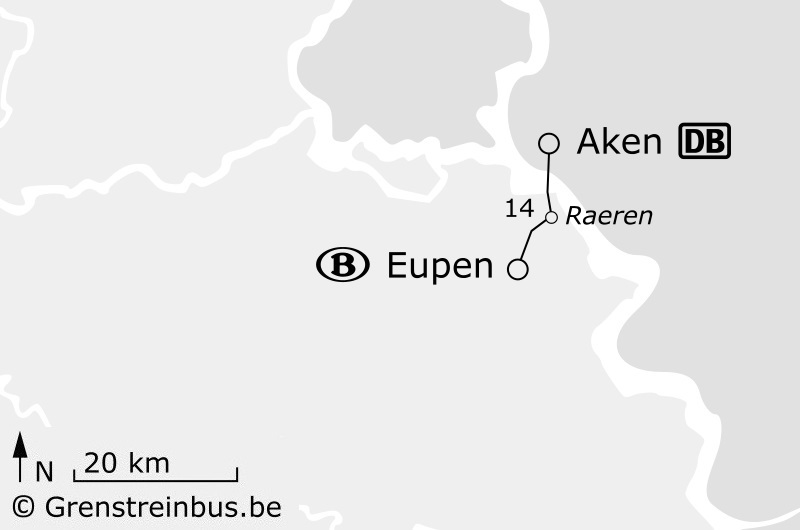 However, there is one single ticket for travellers between Eupen and Aachen. You can buy the single paper ticket &apos;Region3Tarif&apos; from the bus driver for €6.20. With this ticket you can go from Eupen or Kettenis to Aachen Busbahnhof. For children (from 6 to 13 years) it costs €5.00. If you start in Eynatten (Raeren) and go to Aachen, the ticket&apos;Region3Tarif&apos; costs €5.20 (and €4.00 for children under 14 years). In the past, there was a railway known as the Vennbahn, from Aachen via Raeren (in Belgium), Roetgen and Monschau (Germany), Sourbrodt, Weismes and Sankt Vith (in Belgium) to Troisvierges in Luxembourg. Now bus 385 from TEC and DB Rheinlandbus serves Monschau at weekends, and you can cycle on the former railway. Not from Monday to Friday. 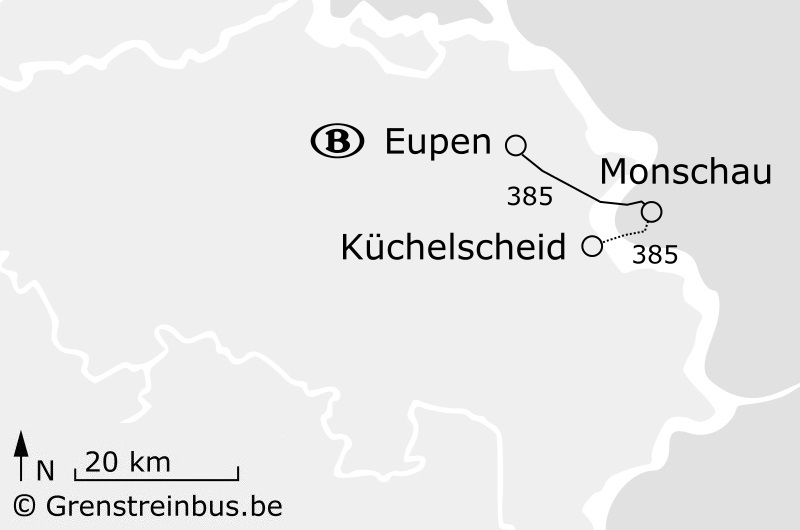 * Note that TEC calls the bus station Monschau Schmiede, and DB Rheinlandbus calls it Monschau Parkhaus. However, both names refer to the same bus station. On Saturday, TEC continues on from Monschau to Küchelscheid in Belgium. The official name of this bus stop is Kalterherberg Bahnhof. 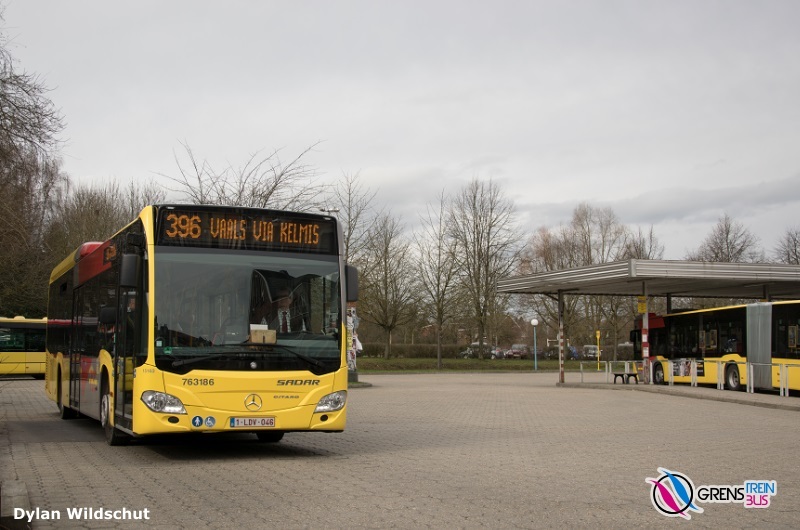 Tickets Bus line 385 is operated jointly by TEC (Saturday) and DB Rheinlandbus (Sunday). Between Eupen Bushof and Ternell Nachtsief TEC tickets are valid, on both TEC and DB Rheinlandbus buses. Between Ternell Nachtsief und Monschau DB Rheinlandbus tickets are valid, on both TEC and DB Rheinlandbus buses. You can buy a day card &apos;Tageskarte&apos; from the driver for €10.70. If you are travelling with a group of 2 to 5 people, choose the group day card &apos;Minigruppenkarte&apos; for €15.40. 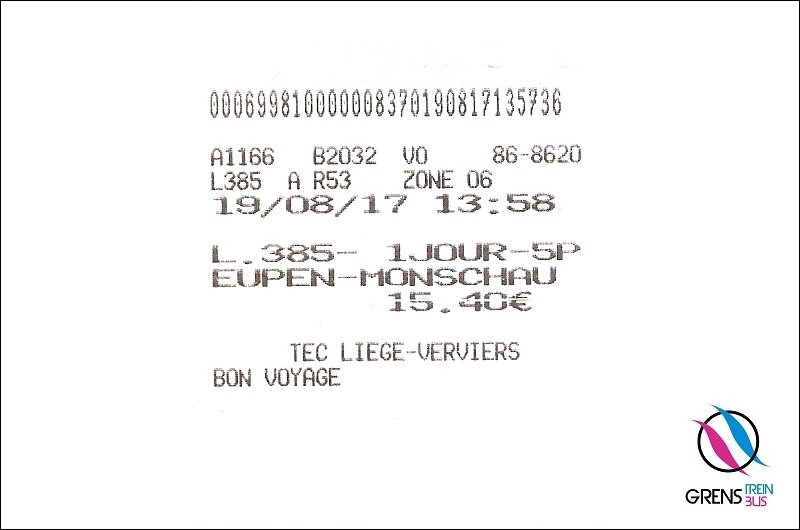 Belgian travellers with a TEC abonnement can take this bus to Monschau provided that they pay a surcharge of €2.70 to the bus driver. You can find full details about the tickets valid on line 385 here (.pdf, in German). 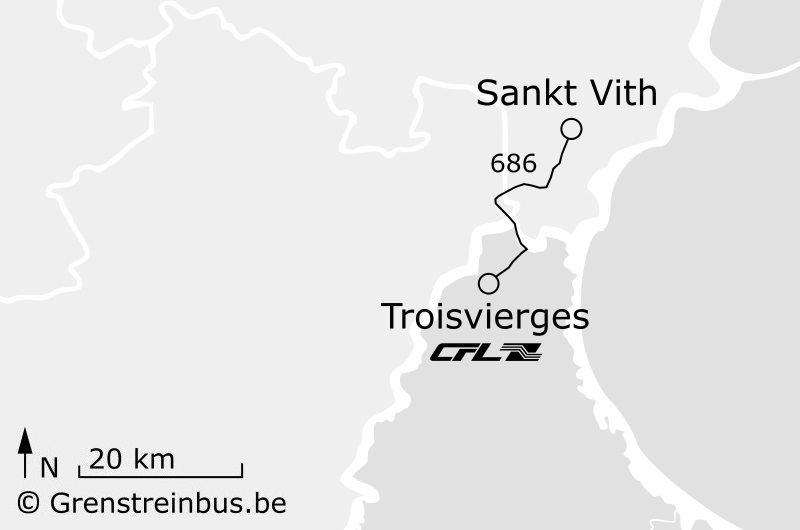 Replacing the former railway (Vennbahn), a RGTR bus connects the town of Sankt Vith, in the German speaking part of Belgium, with Troisvierges in Luxembourg. 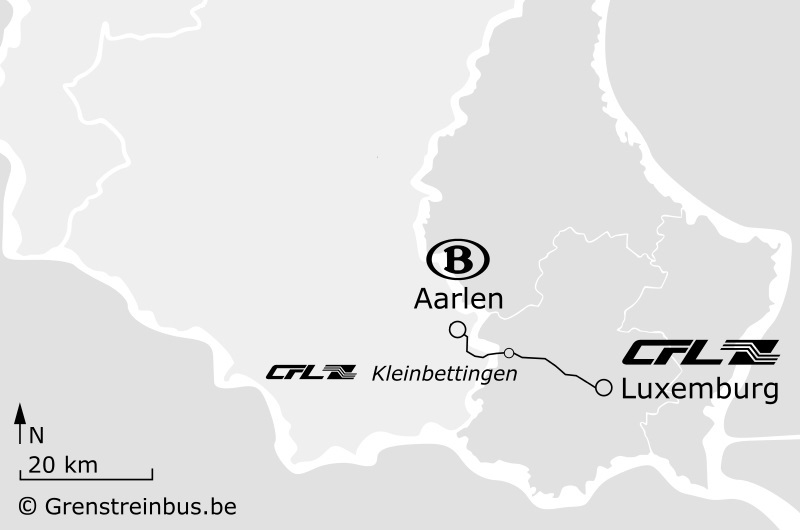 - &apos;Kuerzzäitbilljee&apos; (&apos;Billet courte durée&apos;) (€5.00), which allows you unlimited travel for 2 hours on the domestic RGTR buses (including route 686 Sankt Vith–Troisvierges) and CFL trains (including Athus–Luxembourg). 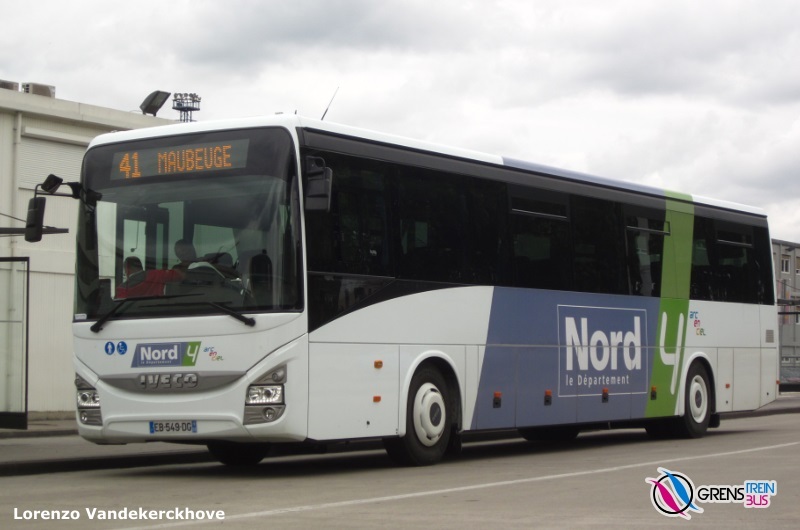 - &apos;Dagesbilljee&apos; (&apos;Billet longue durée&apos;) (€9.00), which allows you unlimited travel for 1 day on the domestic RGTR buses (including route 686 Sankt Vith–Troisvierges) and domestic CFL trains (including Athus–Luxembourg). You can buy both tickets from the driver. 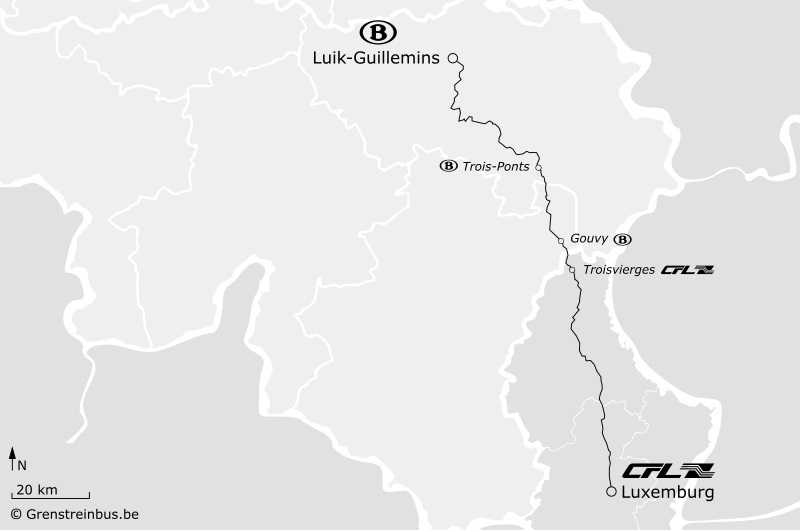 Click here (.pdf) for an overview map of the routes and tariffs in Luxembourg. TEC abonnements are not valid on this RGTR bus service. Information about Luxembourg (student) abonnements is available on the Mobilitéitszentral website. - &apos;Kuerzzäitbilljee&apos; (&apos;Billet courte durée&apos;) (€2.00), which allows you unlimited travel for 2 hours on the domestic RGTR buses and CFL trains. 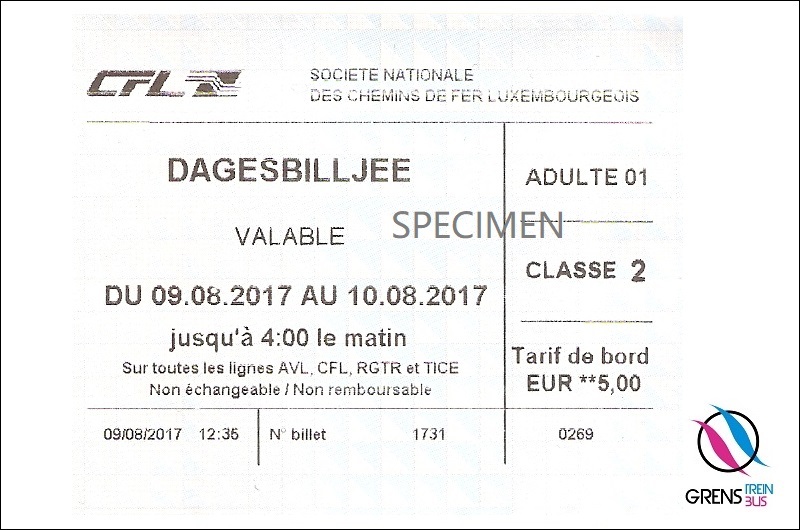 - &apos;Dagesbilljee&apos; (&apos;Billet longue durée&apos;) (€4.00), which allows you unlimited travel for 1 day on the domestic RGTR buses and CFL trains. There is also the &apos;Carnet 10 billets courte durée&apos;, a prepurchase multi-ride ticket valid for 10 trips which costs €16.00 → 1 trip means 2 hours unlimited travel on domestic RGTR buses and CFL trains. This ticket is available at the Mobilitéitszentral ticket office located in the central CFL station in Luxembourg city. 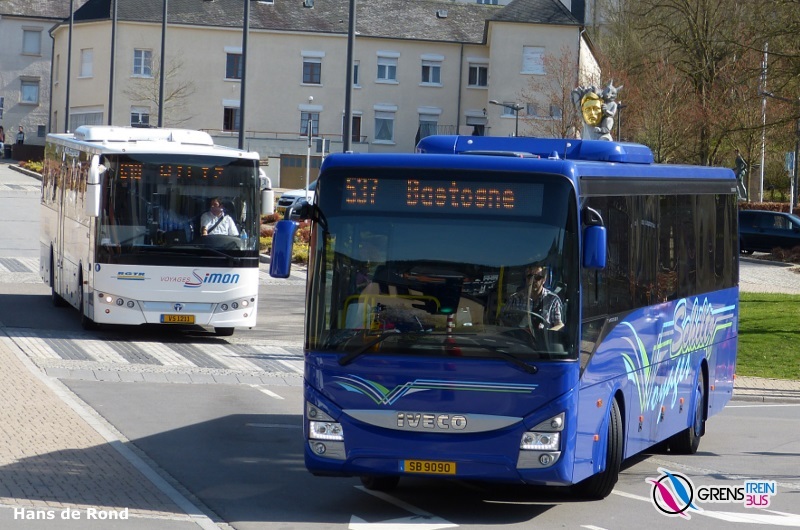 The TEC Namur-Luxembourg abonnements are valid on the domestic RGTR bus services (including route 537 Bastogne–Ettelbruck and route 218 Messancy–Luxembourg) as well as on the bus services in Luxembourg city. Information about Luxembourgian (student) abonnements is available on the Mobilitéitszentral website. 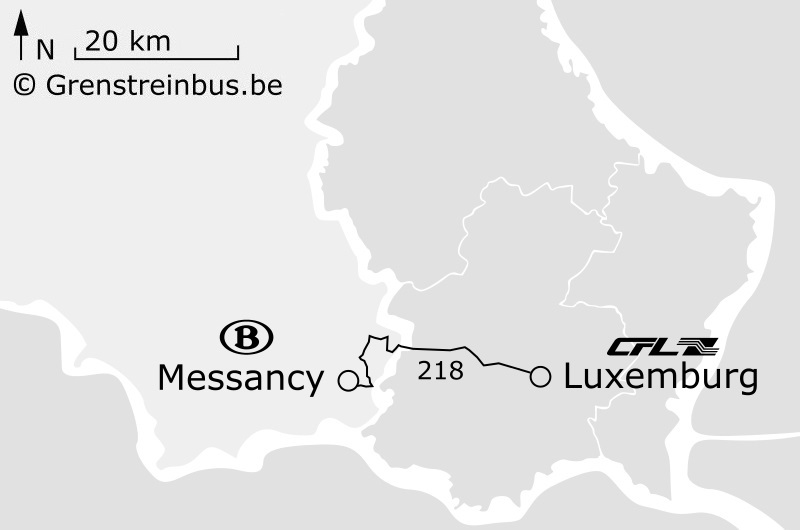 From the Messancy NMBS/SNCB station, there is a Sales-Lentz (RGTR) bus which goes to the Charly&apos;s Gare bus station in Luxembourg city, near the main CFL railway station. 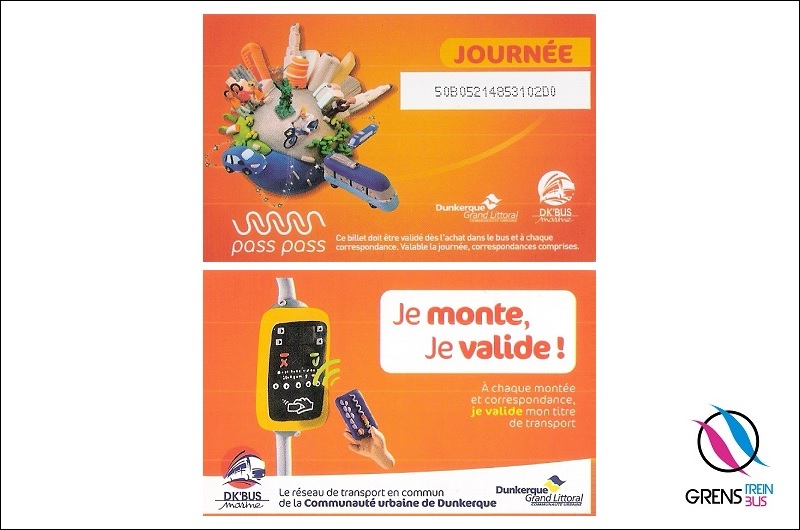 There is also the &apos;Carnet 10 billets courte durée&apos;, a prepurchase multi-ride ticket valid for 10 trips which costs €16.00 → 1 trip means 2 hours unlimited travel on domestic RGTR buses and CFL trains, available at the Mobilitéitszentral ticket office located in the central CFL station in Luxembourg city. If you have questions and/or comments regarding the public transport service, we would ask that you contact the public transport operator concerned. All the data is copyright and may contain errors or omissions. The text, photos and layout of the website must not be copied or modified in any way without written authorisation from Grenstreinbus.be. English translation: D.S. Cromarty and L.O. Vandekerckhove. A HTTP cookie is a small piece of data sent from a website and stored on the user&apos;s (mobile) personal computer by the user&apos;s web browser. Grenstreinbus.be only uses &apos;third-party&apos; cookies. More information.